​Welcome to the 'Your Colleagues' section of our online staff magazine 'Life at the Royal', a page dedicated to the wonderful people who work here, the excellent work they do and their magnificent achievements. 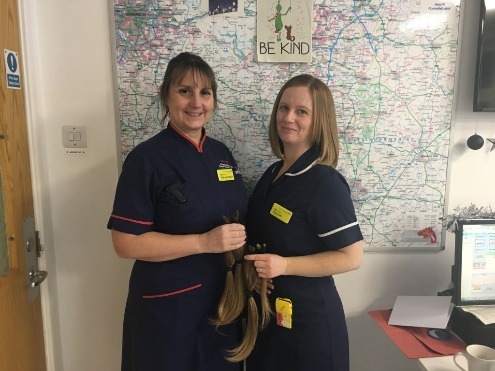 Vicky Nutt is a patient flow sister here at Chesterfield Royal Hospital, and recently chose to have her long hair cut at Burlington’s Hair Salon in Chesterfield in order to donate it to The Little Princess Trust. 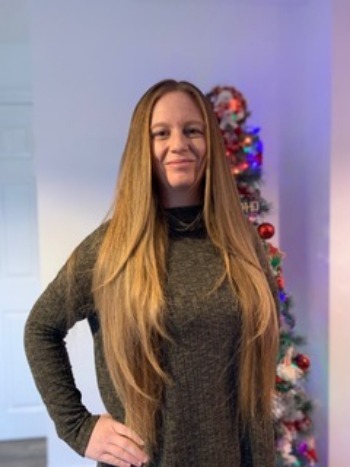 Vicky explained:” I have had long hair for the past 18 years, and, since the birth of my son Alfie in September 2017, I have found it increasingly difficult to find the time to manage it. Since having Alfie it would take me 40 minutes to dry it and straighten it. I was a little bit scared when I saw it being cut – it went higher and higher, but I love it! “After thinking about having it cut, I began to think about how someone else could benefit from my very long locks and began to explore the possibility of donating my hair to The Little Princess Trust – a charity which provides wigs to children and young people up to the age of 24, who have sadly lost their own hair as a result of illness and through cancer treatment. 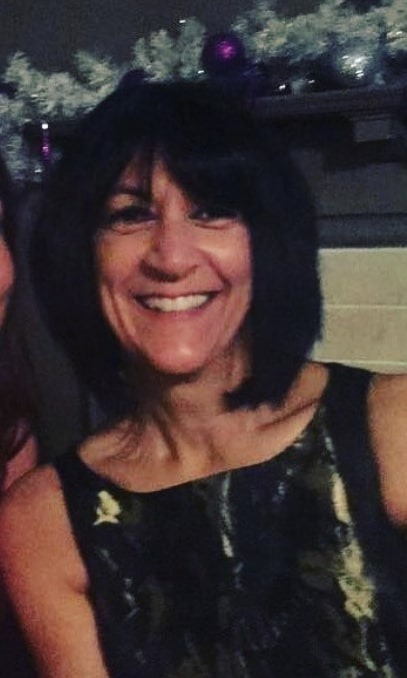 “Following discussions with my manager Sally Wilson (Clinical Operations Manager) we thought it may be a good idea to use the opportunity to raise some money in support of my hair cut at the same time. Any monies raised will therefore be divided between the Little Princess Trust and Cancer services at the NGS Macmillan Unit here at Chesterfield Royal Hospital. Sally Wilson said:” I’m very proud of her – it’s so much of your identity. I’ve only ever known her with hair, and she’s had it like that for 18 years, so it’s a big thing for her to do! As payroll manager she’s one of the biggest cogs in the working wheel of Chesterfield Royal, and she’s now an award winner too after scooping a Chairman’s Recognition Award at a recent event. Having been nominated for an unsung hero award by her boss, Julia Bates was delighted to find that, though she was runner up on the night, she’d been given a separate, special award by the Chairman of the East Midlands Healthcare Financial Management Association (HFMA) to recognise her achievements in managing the financial payroll of the hospital. And it is no easy task …breaking it down Julia told us that there are approx 4,200 of us on the payroll here, all on different pay scales and contracts, whilst added to that is the fact that we are the only Trust in the country which is not on a national pay roll system – national changes and upgrades to the system need to be implemented within the payroll team. It wasn’t all plain sailing though, joked Julia: “I’d had a paddy on a particular day, and after letting me rant for a bit my boss told me he’d put me up for it … I’ve never had anything like that before! Talking to Julia her love of the job shines through and, ever self-effacing, Julia is keen to praise her team:” I didn’t do it myself obviously – we are a family here, having worked with my team for all these years. They are so conscientious and hardworking and so supportive of me. I’ve grown up with them, between the 8 of us we have worked just short of 200 years in the payroll department. I’ve been here 33 years –I started as a trainee payroll clerk and I joke that I work in payroll but I’ve never had a P45! I’ve also been fortunate as I’ve had fab, supportive bosses. Assistant Director of Finance Ken Godber, who put Julia forward, said that:” I nominated Julia for this award in recognition of the many years of service she has given to Chesterfield Royal (and predecessor organisations) as a member of the Payroll team since 1985 and as the head of the team since 2006. “I believe we are now the only NHS body left in the country that does not use a nationwide pay roll scheme which means that implementation of new schemes/technology has to be undertaken by Julia (and her team) and she cannot rely on the national solution so has to work with ever changing demands from the Trust to use these systems more flexibly. Julia takes this in her stride and has established robust reporting systems to enable things to work effectively. “More recently, the new pay award presented its own challenges and whilst most organisations battled to implement the uplift for July and arrears in August Julia was able to deliver both for the July pay run here. Not only did Julia make this happen but she issued regular communications to the Trust so that employees were briefed as far as possible as to what the implications might be. This included direct contact with a small number that (due to movement between pension contribution bands) actually received less net pay following the pay award so Julia contacted them personally to explain the circumstances. This meant that Julia and her team received very few queries post implementation. “As an aside to the very busy “day job”, Julia also hosts the regular Pension and Payroll managers forum across the East Midlands and has done so for many years. 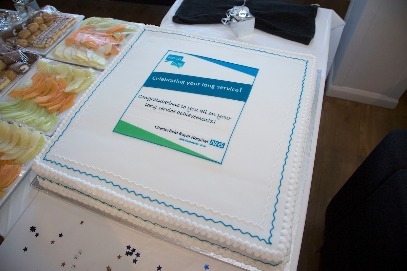 ​Close to 100 people gathered in the Trust’s Relax@theRoyal facility to honour long service to the Royal and the NHS. Those handed certificates have amassed more than three thousand years’ experience within the NHS, proving that the hospital’s biggest asset is the people who work here. 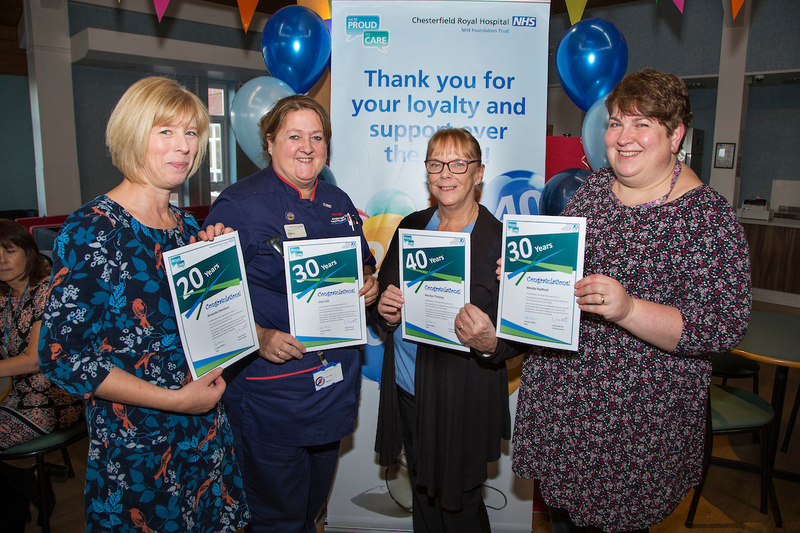 The hospital recognises long service at 20, 30 and 40 years, treating colleagues to a badge relating to the length of long service that they can wear on their uniform, a certificate and a voucher to spend on themselves. They and a friend or colleague are also invited to the event itself, which this year took place on Thursday 15th November, where they enjoyed a piece of cake and a glass of non-alcoholic bubbly. The event is designed to recognise the loyalty and the importance that the Trust places on its colleagues and has proved to be very popular over recent years, supported through Charitable Funds. You can see a slideshow of photos opposite or click here to view the full gallery of photos from the day. Below you will find a full list of those who have been recognise through this year’s long service awards. Marie Allen (Performance Manager), Deborah Alvey (Senior Specialist Audiologist), Angela Baker (Phlebotomist), Emma Barnes, Deborah Beniston (HCA), Helen Bingham (Patient Services Assistant), Christina Bluff (Clinical Typist), Janette Bond (CAO), Sarah Bond (CAO), Deborah Bradshaw (DU Training and Quality Manager),Lorraine Brennan (Senior Cardiographer Practitioner), Melanie Bristow (Patient Experience Advisor), Shelley Butler (Staff Nurse), Tracy Chape (Patient Services Assistant), Jayne Clay (Staff Nurse), Claire Conneely (Sister). Amanda Davidson (Operating Department Practitioner), Janice Dolby (HCA), Michelle Duncan (Operating Department Practitioner), Helen Dunkley (CAO), Dally Elliott (Department Practitioner), Jane Evans (Staff Nurse), Sue Faulkner (PA to Director of Nursing), Carrie Fawbert (Staff Nurse), Conrad Foster (Trainee Advanced Clinical Practitioner), Cheryl Foster (Specialist Biomedical Scientist), Carolyn Goldson (Lead Senior Physiotherapist), June Greenan (HCA), Michelle Hall (Clinical Typist), Clare Hawley (Associate Specialist), Jean Haycox (Messenger), Jane Hutchinson (Operating Department Practitioner). Jackie Jordan (Estates Administrative Co-Ordinator), Diane Kelly (Labour Ward Co-Ordinator), Palepu Kumar (Consultant Surgeon), Sally Anne Lawton (ODO), Maria Leadbeater (McMillan Information and Support Service), Abi Miller (Clinical Lead Speech and Language Therapist), Jacqueline Mullins (Sister), Mandy O’Connor (Receptionist), Alison Oram (Orthoptist), Jennifer Parratt (Consultant), Kymm Pettit (Senior Specialist Audiologist), Debra Pybis (MLA), Lisa Rathbone (Clinic Admin Supervisor), Janine Roberts (Midwife), Jodie Rogers (Specialist Senior Audiologist), Michelle Shaw (HCA), Rachael Shaw (Staff Nurse), Kate Siddall (HCA). Adrian Smith (ICT Service Delivery Lead), Susan Smith (Bereavement Services Officer), Clare Smithers (Matron), Lesley Stevenson (Research Nurse), Jayne Storer (Patient Services Assistant), Michelle Tait (Chidren’s Community Nurse), Steve Taylor (Specialist Biomedical Scientist), Josephine Tingey (Messenger), Marie Tomlinson (HCA), Paul Turner (Senior Radiographer Practitioner), Francesca Umerji (Associate Practitioner), Alison Vaughan (CAO), Matthew Wayman (GP), Claire Wells (Matron), Amanda Whileman (Matron for Research), Glyn Wildman (Matron), Elaine Woodhall-Windle (Admin and Education Centre Manager), Caroline Wright (Sister). Lynn Andrews (Director of Nursing and Patient Care), Lorraine Barlow (Decontamination Assistant), Jane Bolton (Matron), Cheryl Booth (Staff Nurse), Janet Bown (Advanced Radiography Practitioner), Andrew Boyden (Charge Nurse), Michael Conway (Service Manager), Heather Cooke (Midwife), Janet Creswell (Consultant – Obs and Gynae), Susan Davey (Decontamination Assistant), Tracy Draper (Principal Pharmacy Technician), Laura Edey (Night Matron), Kevin Freeman (Cardio-Respiratory Services Manager), Julia Gascoyne (HCA), Clair Gill (Theatre Matron). Joanne Guirdham (Staff Nurse), Jayne Hankens (Head of Children’s Therapy Services), Alison Harrison (Clinical Claims Officer), Jill Hesketh (Midwife), Graham Hutchison (Consultant Aneasthetist), Dr Pervaiz Iqbal (Consultant Physician and Hypertension Specialist), Paul Jones (Principle Pharmacy Technician), Helen Kirk (Specialist Speech and Language Therapist), Christine Lippeatt (Accounts Manager), Susan Merrick (HCA). Michelle Murphy (Midwife), William Purdon (Team Manager), Toni Randell (Clinic Practitioner), Wendy Rason (Patient Services Assistant), Laura Richardson (Sister), Jackie Rose (Pensions Manager), Toni Rouse (Service Improvement Lead), Donna Siddon (Staff Nurse), Jane Stuart, Kathryn Swift (Patient Accounts Assistant), Tracey Twell (Midwife), Diane Wagstaff (Staff Nurse), Justine Walker (Matron), Dr Mark Withers (Consultant Anaesthetist). Mary Bound (Named Nurse Children in Care), Patricia Crowder (Acute Oncology Nurse), Diane Dobson (Staff Nurse), Ian Fretwell (Nurse Endoscopist), Patricia Jackson (Ward Receptionist), Margaret Jardine (Midwife), Andrew Loveridge (General Manager), Patricia McPhail (ODP), Maureen Powell (Nursery Nurse), Josie Sewell (Data Assurance Officer), Dawn Slater (Senior Payroll Officer), Janet Talbert (Staff Nurse), Jill Taylor (Assistant Practitioner), Marilyn Thomas (Theatre Support Worker). ​Our Ophthalmology and x-ray teams are behind plans to make the hospital green, resulting in a prestigious award nomination. 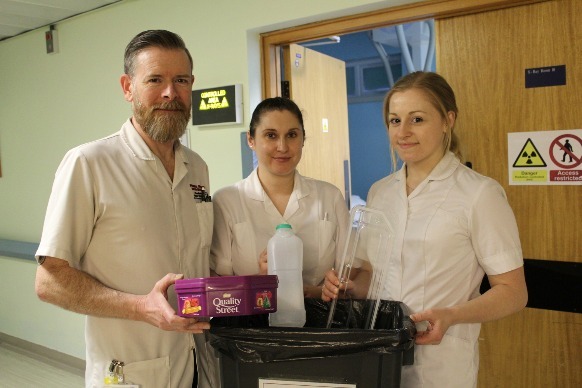 Three members of the Radiography team have been collecting people’s plastic in the x-ray department to recycle as part of their service improvement and, hopefully make a difference to the environment and the way the team approaches recycling. It comes alongside efforts from some of the Ophthalmology team who have been doing the same as well as introducing recycling bins within the department and jointly pushing for a larger recycling bin that can currently be found outside the visitors’ entrance. 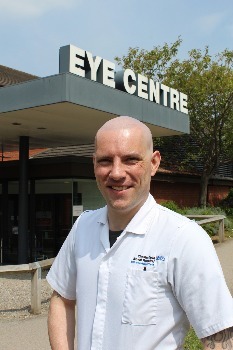 Ophthalmic Photographer Jake Oakley (pictures, right) has been nominated for a ‘Leader of the Year’ award at the Sustainable Health and Care Awards for the work that’s taken place there. In x-ray the idea came from Radiography Practitioner Laura Jones after learning that our plastic waste was being incinerated rather than recycled. ​Clinical Specialist Radiographer Steven Cullen (pictured below) added: “What we decided to do was to bring in four dedicated bins that we placed in our own main X-ray area, MRI, Mammography and the main staff room. Our colleagues could then place any recyclable plastic into the bins, this can be yoghurt pots, plastic milk bottles and even packaging for our clinical equipment as long as it doesn’t qualify as clinical waste which has to be disposed of separately. The use and disposal of plastic continues to dominate the waste agenda with a number of national news articles and reports alongside a high profile piece in BBC’s ‘Blue Planet 2’. 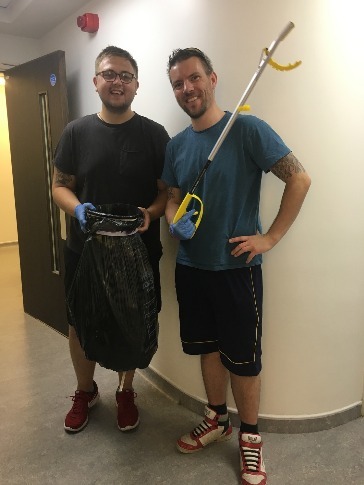 It’s also inspired colleagues at The Eye Centre, in particular Ophthalmic Photographers Jake Oakley and Tom Wilton who have also spent time on their lunch breaks collecting discarded rubbish from the hospital grounds. ​Jake added: “I think it’s everyone’s responsibility to ensure that we keep the site tidy and that we recycle as much as possible. Having been on the Environment Group, we all knew that we were throwing away things that can easily be recycled and we know that people would happily do so. We all do it at home with our green and maroon bins or whatever colour they might be. The only reason that we struggle to do it at work is because we haven’t got the easy means to segregate that waste. Tom put Jake forward for a Sustainable Health and Care award for his work on introducing this recycling initiative to the hospital. 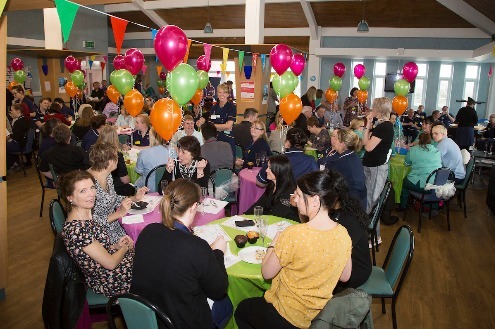 ​More than 200 people came through the doors as part of the Trust’s Applause event. The awards scheme attracted in excess of 300 nominations this year, you can see the complete list of nominees below, with everyone receiving a certificate of recognition for outstanding performance and demonstration of our hospital’s care values. Those who were able to make the event, which took place in the Relax@theRoyal on the afternoon of Thursday 25th October, were treated to a glass of non-alcoholic bubbly and a slice of cake. It’s held twice a year and was introduced following a consultation to gather views about how colleagues wanted to be recognised for the work they do. People are encouraged to complete a nomination card, hand the top half over to their colleague as a personal mark of recognition whilst the bottom half is returned to the HR team, serving as the reference point of an invitation to the main event. ​Chief Executive Simon Morritt and Non-Executive Director Linda Challis said a few works of thanks in tribute to all of those nominated, recognising the incredible work that takes place across the hospital in all clinical and non-clinical areas. You can see a full gallery of pictures from the event by clicking here, you will also find a full list of those recognised at the event and with certificates below. Thank you to everyone who took part in the event…don’t forget you can nominate your colleagues for the next Applause event by completing one of the cards that you’ll find across the hospital, or you can do it online by clicking here. ​ED Team, Mohamed Abdulla (Consultant Chest Physician), Kerry Adams (IBD Nurse), Lynn Adnitt (Linen Assistant), Jill Allsop (Lung Cancer Nurse), Tracey Ambler (Lead Specialist Screening Practitioner), Deborah Amesbury (HCA), Sophie Armitage (Staff Nurse), Sharon Ashby (Cook Team Leader), Ashover Ward, Ashley Atkin (Bank Porter), Facilities Services, Dr Iman Azmy (Consultant Breast Surgeon). Valerie Bagnall (Outpatient Receptionist), Jessica Baker (Healthcare Assistant), Liam Baker (Physiotherapist), Susan Baldwin (Manual Handling), Linda Baldwin (Staff Nurse), Richard Ball (Volunteer Services Manager), Tracy Barker (Senior Matron), Jane Barnes (Advanced Radiographer Practitioner), Stuart Barton (Senior Clinical Engineer), Julia Bates (Payroll Manager), Lyndsey Beardsley (Clinical Educator), Patricia Beighton (Patient Services Assistant). ​Nicky Bembridge (ICT Technical Delivery Specialist), Sarah Bird (Staff Nurse), Keeley Black (HCA), Amy Blackburn (Clinical Typist), Rosalyn Blake (Sister), Lana Booth (HCA), Nicola Booth (Sister), Kimberley Bower (Othoptist), Andy Boyden (Paediactric Charge Nurse), Jayne Bradbury (Catering Retail Manager), Rachel Bradbury (HCA), Lee Brailsford (HR Support service officer), Breast Care Team, Valerie Briggs (Staff Nurse), Gemma Browse (Ward Practitioner), Carole Brunt (Senior Pharmacy Technician). Helen Buckland (Staff Nurse), Oliver Burbidge (CT1 - Speciality Registrar), Diane Burgess (HCA), Glynis Burrell (Ward practitioner), Sadie Burrows (Urgent Care Practitioner), Stacey Burton (Matron), Amy Burton (Trainee Nurse Associate), Mary Callender (Healthcare Assistant), Louisa Cambell (Admin Assistant), Christopher Cammack (Outpatient Receptionist), Wendy Carley (Staff Nurse), Jennifer Carter (Digital Media Officer), Rebecca Cartledge (Screening Co-ordinator), CDU Team, Adam Chambers (PSA-catering), Children's Community Nursing Team, Liz Claridge (Clinical Teacher). ​Alicia Clarkson (HCA), Jayne Clay (Staff Nurse), Hannah Coggle (Associate Screening Practioner), Carole Conneely (Matron), Conrad Foster (ACP), Helen Cooke (Divisional Co-ordinator), Paula Cooper (Ward practitioner), Sarah Cooper (HR Advisor), Helen Corry (Theatre Support Worker), Emma Costello (Comms Support Officer), Rachael Cowell (Ward Practitioner), Jane Cowlishaw (PSA), Amanda Crowder (Department Practitioner), Jenny Dann (Staff Nurse), Claire Davies (Nursing Workforce Co-ordinator), Natasha Davis (Children’s Mental Health Worker), Joao De Almeida (Staff Nurse), Elizabeth Dean (Corporate Governance), Lisa Denton (HCA). Joanne Dey (HCA), Jayne Di-Bartolo (Staff Nurse), Joanne Downs (Operating Department Practitioner), Neil Drury (E-Learning & Learning Portal Lead), Cheryl Duncan (HCA), Bridget Dunks (Union Rep), Sarah Dunn (HCA), Elizabeth Ward, Wendy Elliott (Occupational Therapist), Katie Ellis (PSA), Elmton Ward, EMU, Enhanced Care Team, Amber Evans (HCA), Jane Evans (Staff Nurse), Louise Evill (Bank CT Radiographer), Deborah Farr (Audiology service manager), Carrie Fawbert (Staff Nurse), Leanne Featherstone (HR Partner), Shaun Fell (Volunteer). ​Hannah Fellows (HCA), Rachel Ferreday (Sister), Jason Flanagan (HCA), Gary Flint (Patient Services Assistant), Julie Floyd (Advanced Radiography Practitioner), Rachel Floyde (Matron), Robert Frear (Service manager, bank senior audiologist), Shelby Furness (Admin Assistant), Nicole Galliford (Care Unit Administrator), Howard Garlinge (General Assistant). Jonathan Gee (Data Warehouse Manager), Laura Gilliver (Senior Physiotherapist), Elaine Glossop (Houskeeper), Pauline Goddard (Medical Workforce Officer), Neeta Gogna (Senior Clinical Pharmacist), Carolyn Goldson (Specialist Physiotherapist), Meesy Goodwin (Workforce Information & HR Support Service Officer), Sheryl Gould (Quality Co-ordinator), Cecilia Green (Matron), June Greenan (HCA), Tracey Gunning (Staff Nurse), Haematology Team. ​Marissa Hagan (ST5 - Speciality Registrar), Sam Hague (Staff Nurse), Jane Hall (Senior Radiography Practitioner), Alison Harrison (Clinical Claims Officer), Hannah Harrison (Nurse Practitioner), Julie Hart (PSA), Jo Hartley (OT Team Leader), Hasland Ward, HDU Department, Sophie Hebdon (Staff Nurse), Karen Henman (HCA), Carol Hickman (Sister), Rachel Higgins (Urgent Care Practitioner), Alison Hobbs (Divisional HR Partner), Mary Hogan (Outpatient Receptionist), Karen Holland (Outpatient Receptionist), Coleen Hollindale (OT Technical Instructor). Julie Holt (Patient Flow Clerk), Diane Holt (Patient Services Assistant), Lisa Hooper (Staff Nurse), Sue House (Urgent Care Practitioner), Angela Hussain (HCA), Emily Jackson (Urgent Care Practitioner), Sheree Jackson (Staff Nurse), Ben Jennings (Healthcare Assistant), Chris Johnson (Acting Charge Nurse), Mandy Jones (OT Technical Instructor), Steve Jones (Operating Deparment Practioner), Helen Kearney (Sister), Amy Kelley (Sister), David Kelly (Porter). ​Emma Kime (Senior Pharmacy Technician), Kirsty Kirkpatrick (Sister), Helen Kirkwood (Project Co-ordinator (Young Volunteers)), Hoey Koh (Consultant Colorectal Surgeon), Holly Lancaster (Staff Nurse), Bekki Lawes (Ward practitioner), Katie Legdon (Matron), Katherine Lendrum (Consultant), Donna Levick (PSA), Eddie Lewis (ICT Programme Manager), Ann Lewis (Recruitment Assistant), Michael Lowdon (Communications Advisor), Lisa Lowton (Ward practitioner), Alison Ludditt (Medical Laboratory Assistant), Anna Lund (Consultant), Claire Macey (Discharge Co-ordinator). Macmillian Suite, Joy Maddison (Houskeeper), Louise Mahoney (Staff Nurse), Manvers Ward, Carrie Marples (Education Centre Secretary/ Digital Apprenticehsip System Co-ordinator), Emily Marriott (Trainee Nurse Associate), Beverley Marriott (Nurse Practitioner), Hannah Marsh (Sister), Courtney Mason (Staff Nurse), Rebecca Massey (Staff Nurse), Marie Masters (Trainee Assistant Practitioner), Ruth Masterson (Staff Nurse), Roby Mathew (Consultant Emergency Care), Teresa McArdle (Staff Nurse), Paula McConnachie (HCA), Deborah McGregor (Staff Nurse). ​Carly McGregor (Healthcare Assistant), Gail Mcphail (Matron), Barbara McTighe (HCA), Abigail Miller (Highly Specialist Speech & Language Therapist), Jane Mills (Ward practitioner / Discharge Co-ordinator), Abdulla Mohamed (Consultant), Lindsay Money (Clinical Admin Officer), Lucy Moore (Matron), Dan Moore (ICT Support Technician), Russ Morrow (Head of Fire and Safety Management), Murphy Ward, Nicoleta Nastase (Staff Nurse), Gregory Naylor (Gastroenterologist), Neonatal, Catherine Nicholson (Bank Clinical Typist), Rachel Nicholson (Occupational Therapist). Nightingale Ward, Lacey Nussey (Staff Nurse), Keith Nuttall (Volunteer), Frank O' Sullivan (HCA), Zosia O'Connor (Cook Team Leader), Theresa Ogden (Pharmacy ATO), Joanne Oldale (Sister), Ami Pashley (HCA), Dr Julia Payne (Foundation Doctor Year 2), Laura Pearson (Sister), Jackie Pegg (Staff Nurse), Phil Pepperell (Urgent Care Practitioner), Amber Percival (HR Business Admin Apprentice), Jill Perkins (Senior Dietitian), Sarah Petty (Senior Matron for Maternity Outpatient Services). ​Mandy Phillips (HCA), Kath Phillis (IBD Nurse), Sara Poiney (HCA), Claire Pollard (Claims and Inquest Co-ordinator), Portland Ward, Pre-Assessment Team, Olivia Pretty (Occupational Therapist), David Prosser (Consultant), Jean Raynor (Volunteer), Joanne Rees (Ward practitioner), Mark Renwick (Management Accountant), Mansur Reza (Divisional Director), Amanda Rhodes (Staff Nurse), Ridgeway Ward, Robinson Ward, Paula Rose (Staff Nurse), Julie Rowley (HCA), Lesley Rudram (Sister). Pam Rumbell (Transformation Lead), Matthew Rusling (HCA), Lorraine Sanderson (Arthroplasty Nurse Specialist), Jo Scott (Theatre Support Worker), Emma Shaddock (Physiotherapist), Kayleigh Sheldon (Application Support Lead), Jane Shepherd (Clinical Governance Support Co-ordinator), Martin Shepherd (Head of Medicine Management), Amber Sheridan (Senior Physiotherapist), Shop@the Royal, Kate Siddall (HCA), Marta Simmonite (Outpatient Receptionist). ​Stephen Simpson (Operating Department Orderly), Sue Simpson (Receptionist/Housekeeper), Sue Sims (HCA), Dawn Slater (Senior Payroll officer), Kaye Smedley (Matron), Cathy Smith (Senior Childrens’ Physiotherapist), Adrian Smith (ICT Service Delivery Lead), Mark Smith (Finance Partner), Chloe Spooner (Senior OT), Carmel Stagles (Lead Nurse), Andrea Staley (Senior Matron), Denise Standell (HCA), Gill Stevens (Head of HR), Diane Stevenson (Staff Nurse), Emma Stocks (Plaster Technician * Bank Patient Services Assistant), Jenny Stone (Facilities Training Manager). Becky Sutton (General Manager), Lesley Swales (Sister), Jayne Tague (Head of Nursing), Marie Tann (Safeguarding Lead), Chris Tann (Assistant Director for Estates & Facilities), Emma Taylor (Lead Mentor), Jamie Temlett (Matron), The Endoscopy Team, The Linen Room Team, The Den, The Medical Team, The Pharmacy Department, The Speech and Language Team, Brenda Thornhill (Staff Nurse), Pamela Tipper (HCA), Marianne Topliss (Senior OT), Simon Towers (Communications Advisor). Vicky Warner (Clinic Nurse Specialist), Dave Wass (Ward Practitioner), Emma Waterfield (Upper GI Nurse Practitioner), Heather Watson (Matron), Helen Watson (Matron), Lee Watts (ICT support Assistant), Carrie Wells (Staff Nurse), Rachel Whyman (Head of Nursing), Carol Wigfield (Volunteer), Deborah Wilcock (Trainee Nurse Associate), James Wild (Bank Sonographer), John Williams (Deputy Director of Finance and Contracting), Sarah Willock (Assistant Radiography Practitioner), Mark Wilson (Staff Nurse), Louise Wilson (HCA), Marilyn Withers (Staff Nurse). Marianne Wolverson (Paediatric Diabetes Nurse Specialist), Julia Wood (HCA), Sharon Wood (Specialist Physiotherapist), Elaine Woodhall-Windle (Education Centre Manager), Amanda Woodley (HCA), Emily Wray (HCA), Sarah Wright (HCA), Emma Wright (Outpatient Receptionist), Kimberly Wynn (Infection Control Nurse), X-Ray Department, Pete Yeoman (Paediactric Matron / Charge Nurse), Emma Yeomans (Trainee Nurse Associate), Lynn Guest and Patricia Beighton (PSA), NGS Macmillan Unit Project Team. 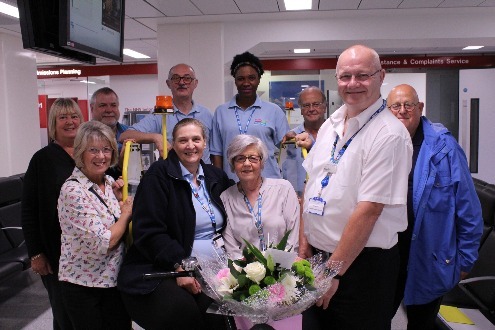 ​The Trust has said goodbye to one of its longest serving nurses after a magnificent 35 years’ service. 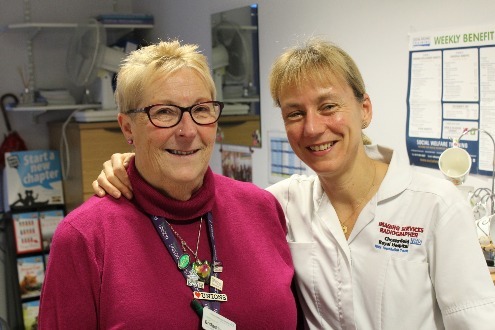 Isobel Dawson (pictured, right) started her training at the old Royal in the town centre in 1983, qualifying as a fully-fledged nurse in 1986 where she started out working within Urology which, back then, was based on Devonshire ward. Isobel said: “I worked part time night in surgery after Urology when my kids were young and was one of the night practitioner team when that was introduced, part of the original team which was exciting. I spent five years on Holywell day case as a band 6 and was also involved in the development, design and build of the Chesterfield Eye Centre which was a massive project and something I was proud to be a part of. 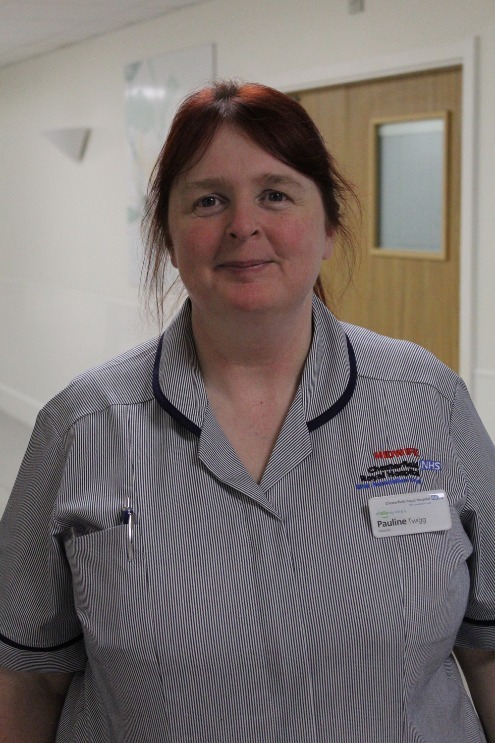 “I enjoyed being a band 6 but decided to drop a band to spend five years on Murphy ward to get closer to patients and be more hands on in terms of patient care because that was the side of things that I enjoyed the most. I’ve spent the last two years on Elmton ward which has been hugely enjoyable and they’ve been a great team to work with. “A lot’s changed in my time as a nurse but what I’ll always take away from it and what I’ve enjoyed the most is that interaction with the patients, looking after and caring for them on the wards. I will really miss that but also the social aspect of working on a busy work because they’re my work family and my support network who have always been there for me. Wherever I’ve been, I’ve always had a good team to work with and that’s part of what has kept me here for so long. On behalf of everyone at the hospital and all those patients who you’ve looked after and cared for over the last 35 years, thank you for everything and have a very happy retirement! ​Two of our colleagues are hoping to make a difference to the disadvantaged with a few cardboard boxes. Lyndsey Shaw is the Service Manager for Surgical Support Services and is collecting shoeboxes filled with goodies for the Samaritans Christmas Shoebox Appeal, aimed at helping children throughout the world. Meanwhile, Midwife Jemma Temple is doing the same thing for the Chesterfield Shoebox Appeal which looks to make a similar impact at a local level for children, the homeless and the elderly. Lyndsey (pictured left) is accepting filled Shoeboxes for the Samaritans appeal via the Royal, collecting them from the Surgical Management Office next to ITU. The appeal is designed to make a difference to the lives of children in disadvantaged parts of the world and the communities where they live. She said: “Some of the items that can be packed into one of these shoeboxes are things that we might take for granted but that can make a big difference to a small child. Things like small musical instruments, puzzles, notebooks and pens as well as the more practical items such as toothpaste, toothbrushes or a wrapped bar of soap. ​With Lyndsay’s involvement, any shoeboxes that are dropped off with her and sent via the Surgical Support Services office will be acknowledged with a certificate. This means that we will know how many gifts have been sent from this hospital and there is also a way of knowing where your parcel has gone, just visit the website for more details. ​Jemma (Pictured right during a previous appeal) said: “This is the fourth year I’ve done this and the response has been excellent with the number of shoeboxes I’ve collected going well into the hundreds. My colleagues and friends have also helped with the collections and I’ve been supported by the Royal College of Midwives. The support we had from the hospital was great, especially from the Birth Centre, Neonatal and Imaging and we collected a lot from my home town of Holmfirth as well. ​The deadline for getting shoeboxes in to Lyndsey is Monday 12th November to allow her time to take the donations to her local drop off point in plenty of time. There are a number of places where you can find out more with full details on their website, www.samaritans-purse.org.uk including what you can and can’t put in the shoeboxes. She also has Christmas child shoeboxes available for 50p if you don’t have a shoebox for your bundle. There is a little more time for Jemma’s appeal, with donations accepted at the Birth Centre up until December 14th. The appeal has a Facebook page at https://www.facebook.com/Chesterfieldshoeboxappeal/ and you can find out more about the different types of shoeboxes you can you donate and what to include by downloading one of the four posters below. If you don’t have a shoebox then a donation of items in a bag is perfectly fine. ​Congratulations to two of our colleagues in the patient safety team who have just received the highest possible grade in a nationally recognised course. 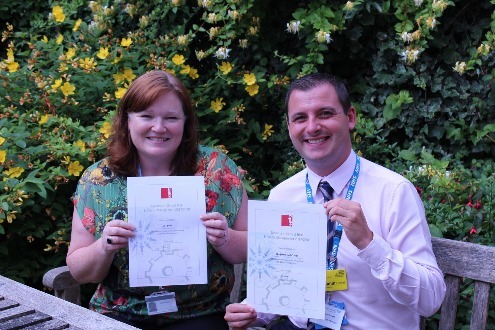 Patient Safety Lead Jane Bown and Risk and DATIX Manager Ben Cowell both received an ‘A’ grade with Distinction in the Capstick run ‘Clinical Risk and Claim Management’ course, the only course of its kind in the country. It’s a tremendous achievement and ensures that they have the qualification to back up the knowledge and expertise that they have gained working within patient safety. 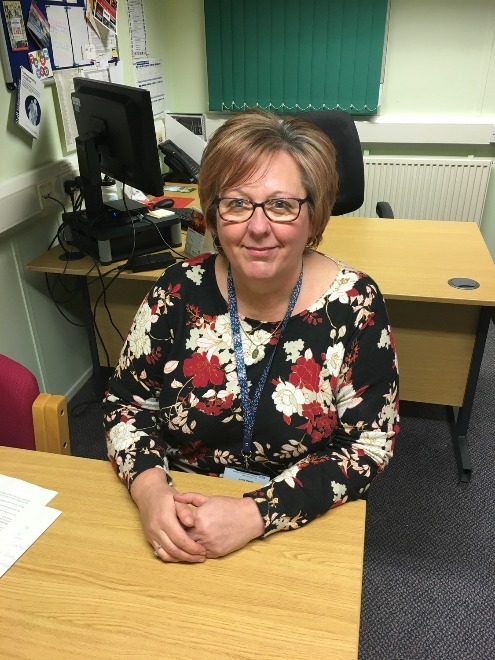 Jane said: “Within my role as patient safety lead I have learnt a lot working within the department, but a lot of the legal side has been learnt whilst looking into different cases rather than anything academic. What this qualification has allowed me to do is consolidate the clinical risk whilst learning more about handling clinical claims. Ben added: “It was the other way around for me as I was hoping to learn more about the clinical risk side. I worked for a different Trust when I started and was very interested in the position that came up at the Royal, something that this course and Jane’s advice helped me to successfully apply for. My background was more legal so it was a great opportunity for me to branch out into risk. The diploma involved a commitment of one day per month in Leeds over a six month period on top of preparation for a three hour written exam and a number of assignments based on the weekly lectures. It was a six month course with the exam taken in May and the diploma awarded in July 2018. Chesterfield Royal Hospital NHS Foundation Trust has signed the Armed Forces Covenant pledging support for current and future employees who are members of the military community. 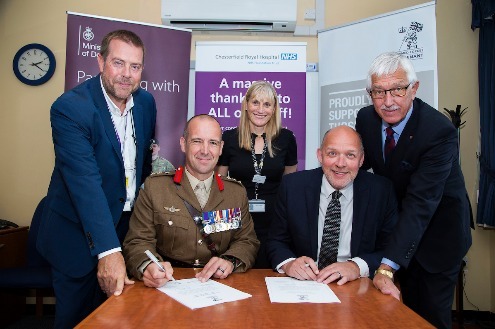 The event took place on 14 August at the Chesterfield Royal Hospital when the Trust Chief Executive, Simon Morritt, signed the Covenant; Colonel Adam Fraser-Hitchin, Deputy Commander (Reserves) from the Army’s HQ 7th Infantry Brigade sign the Covenant on behalf of Defence. In signing the Covenant, the Trust commits to support the Armed Forces community, recognising the value that Serving personnel, regular and reserve, veterans and military families contribute to society. The Covenant aims to make sure that those who serve or who have served in the Armed Forces, and their families, are treated with fairness and respect and face no disadvantage. Two members of staff who used to work for the Armed Service represented the Trust. Jennifer Clarke is an HR Advisor, she served in the Army and was a Warrant Officer Class One, Regimental Sergeant Major. Meanwhile Mike Haywood served as a Corporal Class One in the Royal Military Police, serving in Germany and Ireland amongst other countries. He is now the Trust’s Deputy Chief Operating Officer, showing skills gained in service can be transferred to the NHS. Congratulations to all of those nominated for the inaugural Junior doctors recognition and rewards ceremony. We have 165 doctors in training thoughout the Trust alongside around 60 trust grade /specialty / associate specialist doctors. They've had a lot to deal with over the last couple of years but have continued to deliver high quality clinical care across the board and are a credit to this hospital. This event, introduced by Chair Helen Phillips with awards handed out by Medical Director Gail Collins was about saying thank you and acknowledging the contributions of each every one. 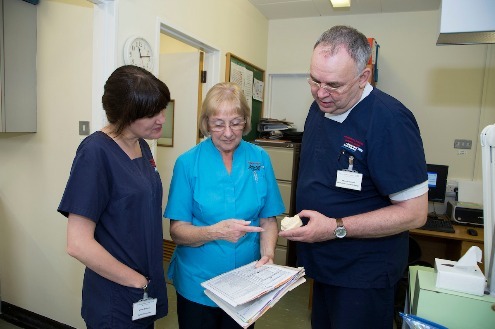 Categories including compassion, kindness and care, delivering high quality care, teaching, training and lots more. In total we had 70 nominations made for 42 doctors. So many different staff groups took the time to submit some wonderful nominations from fellow trainees, consultants, nurses and ward clerks. Below we have listed all of the 'winners' and the reasons for their nominations but they represent all Junior Doctors and we would once again life to reiterate our thanks for the exceptional and life saving work they do. See the slideshow opposite or click here to view the gallery thumbnails. ​Team Working Award: Cat Godsave – SpR MedicineCat is an excellent medical registrar who, despite being very busy, always makes time to support her junior colleagues. She is fast and efficient, always approachable when trainees have any queries or need advice and her calm, open and non-judgemental nature make busy shifts much more manageable. Marissa is thorough and confident in her role, supports junior staff, is hard working and extremely knowledgeable. She is kind and gives care in a compassionate and supportive way, making sure she includes family and patients in decisions about care. Marisa is extremely reliable, trustworthy and a pleasure to work with. Harry has spent a great deal of his own time educating others and has designed a fabulous simulation programme for 5th year medical students. This has received wide positive feedback from students and facilitators (FY1s and Core level trainees). Well done!!! Matthew is an excellent and caring doctor who shows great dedication to his patients. He is knowledgeable and kind, an amazing team worker, compassionate, hardworking and a great teacher; a true asset to our ENT department. Dr Lowe has made great progress as a core trainee. He has very good technical skills, is keen to learn newer techniques, has a great team working ethic and is polite and caring towards his patients. He is always highly motivated and has engaged in teaching, audit and research projects. He rightfully deserves a big thank you for all his efforts and hard work! Charlotte has made an excellent contribution to the Hospital at Night committee, and in a wider leadership role in the Division through improving the arrangements in place for communication and handover. She ensures the smooth running of the acute medicine rota and is a role model for others. Anna is passionate about her job and shows an admirable enthusiasm for teaching others. She is approachable and always willing to help and support junior colleagues. Anna has made an excellent contribution to the TTF and deserves recognition for the positive approach she takes to problem solving - always wanting to achieve what is best for patients. As Emma progressed through her F2 placement in Psychiatry it was very clear that her compassion and manner was highly attuned to the emotional upheaval patients may be experiencing when in Crisis. Her compassion for those under her care is exemplary. This project was accepted for oral presentation at the Montreal Orthopaedic World Congress 2018 where it was hailed as one of the best projects, described as having "identified a potential problem, confirmed by audit against sensible standards, then made a SMART intervention to improve the quality of consent for elective orthopaedic surgery. They confirmed the positive impact of their intervention by repeat audit". ​“I have only just started volunteering, but I have enjoyed socialising with the patients on Durrant Ward. I have found them to have a varied conversation and enjoyed the odd game of bingo. It’s not like work, it’s fun!" ​Thank you to all of our volunteers for everything they do. If you would like to join our incredible team of volunteers then you can find out more on our website by clicking here. We have also produced a video that features more of our volunteers explaining what they do and how you can make a difference too. You can view that video opposite. London to Paris in Lycra! ​Seven of our Consultant Anaesthetists are joining forces to cycle from one iconic European landmark to another to raise money for an international charity aimed at promoting safer surgery worldwide. The intrepid septet will leave Tower Bridge in London on Wednesday 27th June, arriving at the Eiffel Tower four days and 200 miles later. They’ll be doing it to raise money for Lifebox, a charity that raises money and resources to help provide safer surgery and anaesthesia to less developed countries with lower resources. Tim Meekings is one of the Consultant Anaesthetists taking part, he said: “It’s a pre-defined route that was devised by cyclist Donald Hirsch, intended to plot the best route in terms of low traffic whilst maximising the scenery and woodland. It’s split into four stretches that takes in 70 miles from London to Newhaven, another 40 miles into France that involves a ferry trip, a third day taking in 60 miles and a final half day which takes us to Paris. 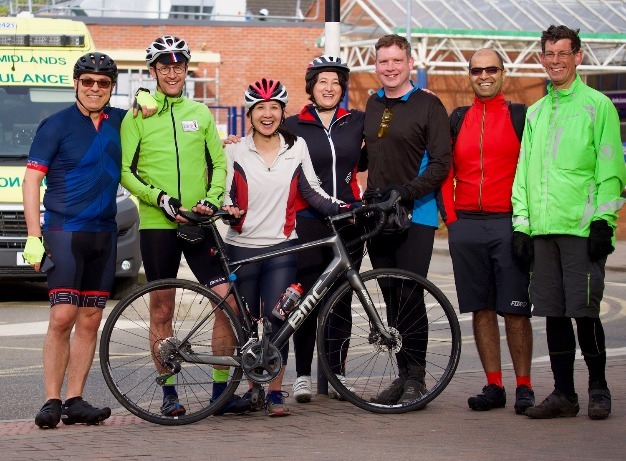 ​Tim will be joined on the mammoth bike ride by his colleagues Nick Spittle, Sarah Beavis, Jeremy Groves, Julie Hui, Amar Jawad and Rahul Bhansali. The group has a mixture of experience, for example Tim has done a fair amount of cycling in this country and Nick and Sarah have cycled through parts of Vietnam. On the other end of the scale, before agreeing to embark on this journey Rahul didn’t even own a bike. However they are training and preparing as a group with the more experienced riders helping the others get ‘up to speed’. 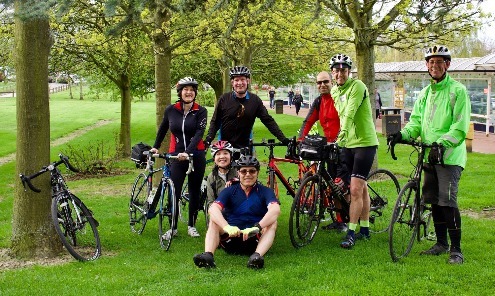 They have already been training on weekends off by cycling round the Peak District and some of the group are now regularly commuting to work by bike in all weathers to prepare for the trip. ​Lynn Fowler was one of the first in the new wave of volunteers to join the Royal’s ranks after the service was relaunched in 2015. She arrived from Australia and introduced some of the ideas she picked up down under, volunteering at Perth Royal Hospital, making a real difference to the lives of patients here. One of the additions, made possible thanks to Lynn’s input, was the return of the shop trolley to our inpatient wards. The trolley offers patients a welcome link to our shop@theRoyal, providing patients who struggle to get off the wards with a selection of toiletries, refreshments, snacks and treats to make their lives a little more comfortable. Lynn (pictured front row, second from left) said: “Before I came back to Chesterfield I worked in Perth for five years doing exactly this. I visited the Royal shortly after I returned from Australia and called into the Assistance and Complaints offices to ask if there was a similar service here. At the time they told me that there wasn’t one and pointed me in the direction of Richard and the voluntary service and the rest is history. 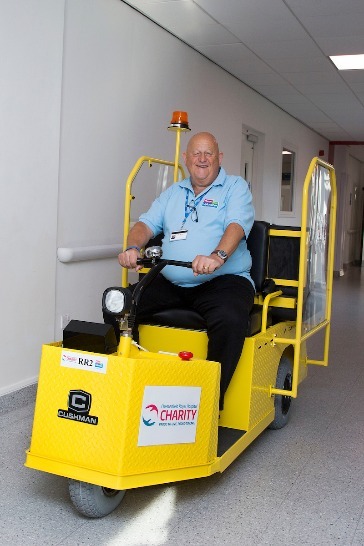 “More recently I’ve been driving the Royal Rider which involves taking people with mobility issues to their outpatient appointments or on the wards if they’re visiting loved ones from the main entrance. I’ve been told that I’ve taken almost a thousand people which is surprising but, for me, it’s nice to be able to make a difference and to help out where I can. Our volunteers do some amazing work across the Trust, giving up their time freely to improve the experience of our patients and staff. If you would like to know more about volunteering or would like to volunteer your time then you can visit the dedicated volunteer section of our website by clicking here. ​The Royal prides itself on ‘growing our own’ workforce through the use apprentices and apprenticeships, which is why we’re delighted to have been named as the Large Employer of the Year at this year’s North Midlands and South Yorkshire Apprenticeship Awards. Presented by the winner of the BBC’s Young Apprentice series, Ashley Porter-Exley, the awards celebrate and recognise the hardworking individuals and organisations involved in apprenticeships. 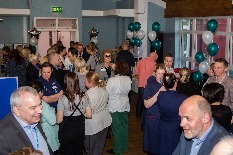 As a relatively small hospital in the large area covered by the awards, the Trust was the only hospital to have made the shortlist at the ceremony, and fought off competition from regional and national organisations to seal the award. Sarah Sewell, the Royal’s Inter-Professional Development Lead, picked up the award at a ceremony, held at the Showroom Cinema in Sheffield on Tuesday the 15th of May. ​She said: “We were in good company with the other organisations nominated and awarded at the event. With several colleges and a range of other businesses, including the likes of Specsavers, at the event, winning the award for best Large Employer helps to boost our credibility in the region. 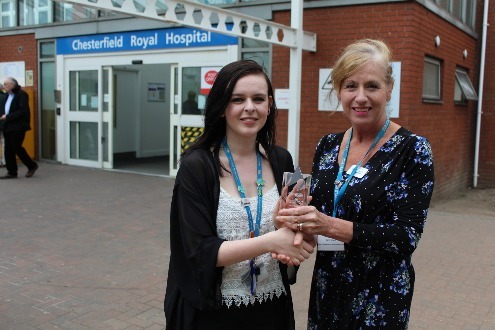 Marking the first award for the Apprenticeships team at the hospital, The Trust has Carrie Marples, the Apprenticeship Programme Coordinator/Secretary, to thank for being nominated. 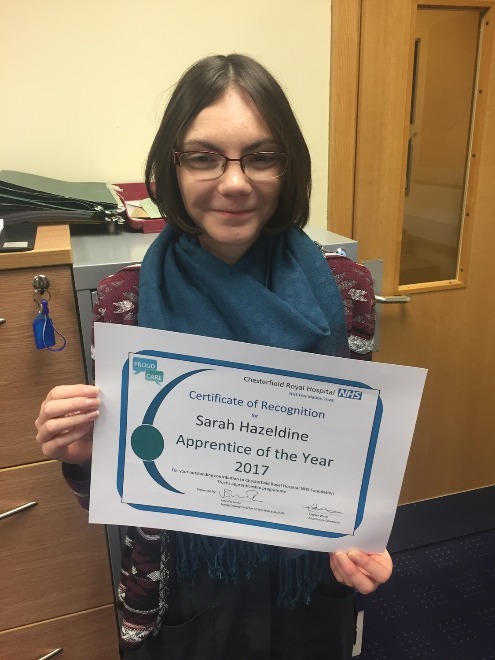 Carrie submitted a seven page document to apply for the award, featuring case studies and outlining all the hard work and achievements by apprentices at the hospital and why CRH deserved to be named the winner. “I saw the awards advertised on the Derbyshire Times Facebook page and thought it would be worth submitting an application for it. It took me three weeks to get the submission sent off, but it was worth it in the end, and all the feedback has been really positive. This is the direction we want to take apprenticeships at The Royal, but I didn’t expect us to win it. It’s the first one we’ve put ourselves forward for. It gives us something to shout about. 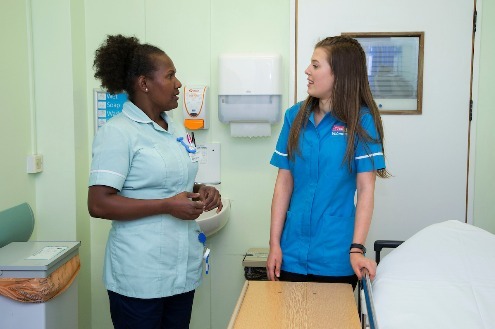 “Apprenticeships are often seen as a negative and there’s a perception they’re just for school leavers, but apprentices are in almost in every department in the hospital and they have an impact on all staff. “Winning this award is a great recognition of the fantastic work our apprentices do and shows staff that there are opportunities to upskill through the many programmes we have. “We have a lot of programmes and opportunities running. This award will help attract new talent and raise awareness of what we have to offer. 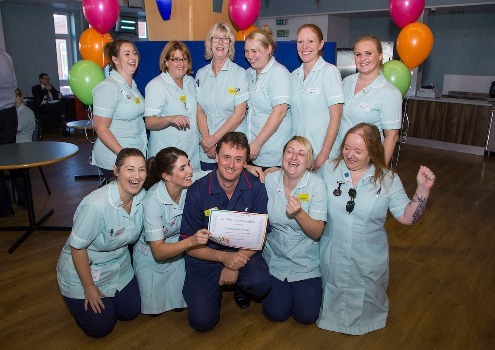 It’s a brilliant award for the hospital to win and gain good exposure. A very big well done not only to the Royal's Education team, but to all of the apprentices across the Trust! Your hard work hasn't gone unnoticed! To find out more about apprenticeships at CRH, click here. 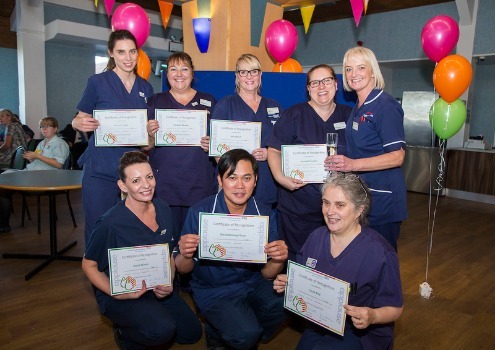 More than 250 people turned up to the Trust's second Applause awards, the staff recognition scheme, that took place on 14th March. Almost 250 teams and individuals were nominated for recognition, each one receiving a certificate and invited to Relax@theRoyal to enjoy some cake and (non-alcoholic!) bubbly. The ceremony recognises those who go the extra mile to help their colleagues, patients and this Trust, whether it's related to work and patient care or simple acts of kindness that have supported colleagues through difficult times. The awards were introduced in 2017 following a large scale survey to find out how colleagues would prefer to be recognised. To nominate a colleague, an individual fills out a card explaining why that person has been recognised, this is then handed to the individual whilst the bottom half is posted into one of our 'Applause post boxes' where their name is added to the invitation list for the recognition ceremony. Here is a list of those nominated - click here to view the Applause Photo Gallery! Julie Adams, Haley Allison, Sally Allsop, Deborah Alvey, Emily Anscombe, Karen Arnold, Zoe Ashley. Dr Thida Aung, Lisa Bailey, Laurie Bainbridge, James Baker, Richard Ball, Dr Joanna Banks, Tracy Barker, Emma Barnes, Hayley Barnett, Jack Barraclough, Adam Barrow, Lyndsey Beardsley, Denise Bellamy, Kelly Bennett, Naomi Bennett, Hannah Birchall, Tracy Boden, Emily Bown, Andy Boyden, Debbie Bradfield, Helen Buckland, Julia Burton, Lorenzo Cafisi, Cathy Cahill, Christopher Cammack, Kim Casteluccio. Alison Cawley, Anna Challands, Jane Chapman, Bridget Charity, Sue Chell, Liz Claridge, Rachael Clarke, Claire Conneely, Carole, Conneely, Gemma Cort, Emma Costello, Amanda Crowder, Jill Cullen, Kerry Daff, Jenny Dann, Tim Davies, Jan Dolby, Joanne Doncaster, Linda Doughty, Neil Drury, Gary Durrant, Heather Durwood, Tony Eaton-Baudains, Emma Eden, Laura Edey, Michelle Farrell, Leanne Featherstone, Lea Fielding, Emily Fieldsend, Gary Flint, Dr Aiwayne Foo, Lynn Fowler, Gayle Froggatt, Joanne Froud, Nicole Galliford, Claire Gill, Sandra Glassbrook, Barry Glover, Deborah Goodhall, Meesy Goodwin, Tracy Gorton, Sarah Gregory, Dr Robin Gupta, Lauren Hall, Paula Hannan, Nikki-Louise Hardwick, Sophie Hart, Elizabeth Haslam, Joanne Heaton, Rebecca Hitchen, Alison Hobbs, Tracey Hodkin. Julie Holt, Warren Hutson, Helen Inger, Linda Jackson, Ben Jennings, Marg Jeske, Jayne Johnson, Ann Johnston, Mandy Jones, Charlotte Jones, Pancy Jose, Kathryn Joseph, Helen Kearney, Lynsay Keeble, Sabrina Kemp, Vittoria Kerry, Debbie Kilmartin, Jackie Kirk, Kirsty Kirkpatrick, Helen Kirkwood, Dr Kiran Kumar, Diane Lander, Katie Legdon, Ann Lewis, Dr Lindsay Lewis, Lisa Lewis, Lisa, Li, Steve Lloyd, Tanya Lonsdale, Suzanne Lowe, Shereen MacDonald, Dr Nilakshi Madurapperuma, Gillian Maiden, Lana McLaren, Dr Nicola Medd, Claire Mestdagh, Elaine Miles, Roy Millington, Eldon Millward, Dr Abdikudas Mohamed, Lola Moore, Dr Helen Moore, Dawn Moore, Leanne Morgan, Patricia Moslin, Emily Moulds, Lyndsey Needham, Clare Nichols, Geoff Norton Zoe Notley, Barry Nuttall, Keith Nuttall. Jake Oakley, Kelly Oliver, Barry Parker, Pauline Parker, Matthew Pearce, Amber Percival, David Poole, Lynsey Poulton, Sue Powell, Patrick Preece, Paula Preece, Amy Quick, Donna Rawson, Joanne Rees, Amanda Rhodes, Denise Richards, Maxine Saunby, Helen Scott, Mr Brijesh Sharma, Prateek Sharma, Michelle Shaw, Sue Shore, Maxine Simmons, Melanie Singleton, Clare Slater, Becky Smith, Janine Smith, Nicola Smith, Jennifer Smith, Hal Spencer, Sabah Stafanous, Carmel Stagles, Alicia Stead, Lesley Swale, Donna Swift, Emma Taylor, Jack Timmins, Natalie Townsend, Amelia Tunstall, Vicki Turner, Emma Turner, Louise Turner, Kate Turner, Sarah Turner-Saint, Mandy Waddell, Angela Wainwright, Shelley Walker, Helen Ward, Alan Ward, David Wass, Lee Watts, Lisa Weston, Claire Whitbread, Diane White, Rachel Whyman, Debbie Wildman, Rebecca Wilks, Tony Willis, Claire Wilson, Sally Wilson, Thomas Wilton, Yasmin Woolley, Liz Wright, Kimberly Wynn, Pete Yeomans, Asia Zitti. Ante-Natal Team, ITU Nurses, Catering and Domestic Team, CDU, Colonoscopy Team, Discharge Hub Team, Eastwood Ward, Emergency Department, Elizabeth Ward, Elmton Ward, EMU, Endoscopy Team, ENT Audiology, Eye Centre, Holywell Ward, Medical Physics Reception, Murphy Ward, Ophthalmology, Rheumatology, Portland Ward, Ridgeway Ward, Cafe, Theatres, Jan Hunt, Meghan Ashworth, Karen Scattergood, Cathy Wilson, Julie Lang, Helen Melville-White, Wendy Layton, Liz Bostock. Congratulations and thank you to everyone who was nominated...you're all a credit to this Trust! ​In 2017, the Royal signed The Carer’s Charter to recognise its commitment to carers and the role they play in the treatment and care of our patients. Much of that achievement was down to the hard work of Rebecca Cowley (pictured, left, with Chief Executive Simon Morritt following the signing of the Carers' Charter) who, as Carers Project Lead at the time, left the role once the project came to an end. Rebecca has now returned to the Trust as Carer Liaison Officer, a new role supported through the Chesterfield Royal Hospital Charitable Funds. Rebecca said: “Having worked in carer support for ten years and also being a carer myself, I am extremely passionate about making sure that the role of the carer is recognised and that they get the support they deserve. This new role means that I can continue to implement the charter that I worked on. ​“My job now is to support the carer when they come into hospital on a one to one basis. For example, there could be some confusion about what’s happening in relation to the treatment of the patient, perhaps the carer is receiving conflicting or mixed information and is struggling to make sense of it. They can contact me and I can come and help get to the bottom of it by talking to the clinical teams and decoding the information. The signing of the Carers’ Charter, supporting the Key Standards the Trust has put into place for carers, acts as a promise that the Royal is committed to working together with the carers of patients receiving treatment at the Royal. It recognises that carers are in a unique position to know a patient’s personal needs and requirements on a daily basis and can be included in decisions about their treatment. Rebecca added: “The project evaluated beautifully, was nominated for a Nursing Times Award for Enhancing Patient Dignity, and it was obvious that the changes made had really made a difference to carers. I was concerned that, without a designated role to support patient’s carers and the hospital staff, this work would fade. However, with great support from my Line Manager Rachel Whyman, who is as passionate about carers as I am, we successfully applied to funding so that both carers and staff have a point of access for information, support and advice right in the heart of the hospital. “In my experience it’s clear that one of the most frustrating issues for carers is communication. They can feel at their most vulnerable and confused while the person they love is in hospital. Knowing that I am here to support them, whether that is explaining the patient’s pathway, attending discharge meetings or general advice on how to cope with their caring role can empower them. Just knowing someone is there if they need them, even if they never use the service, is support alone. “My plans for the service are to provide information and advice about carers’ worries and concerns, help carers communicate with staff, attend hospital meetings with carers for support and refer on for support within the community. I’m working closely with our dementia support service, the local carers association and young carers association to make sure that we work together to provide a robust but approachable support service to carers. I’ll also ensure that Carers Champions are up to date on their training and that staff are generally ‘carer aware’, ready and able to support them by referring them on to me. ​Congratulations to two of our therapists who settled a regional score whilst raising money for one of our services. 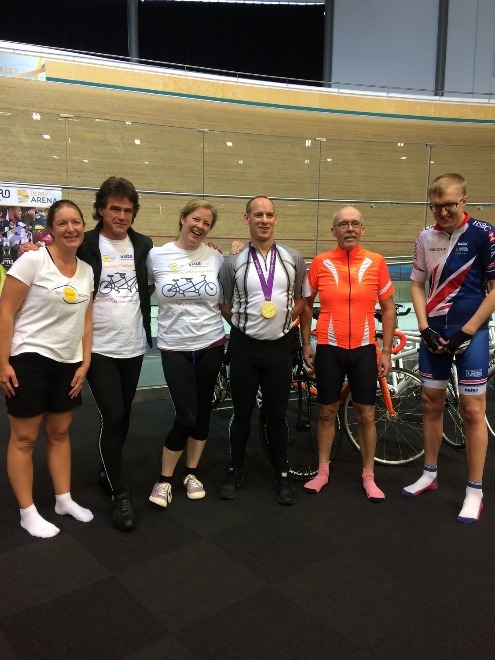 Senior Occupational Therapist Mary-Ann Willmott (third from lef and Senior Physiotherapist Mike Winder (second from left) took part in a sponsored tandem cycle at the Derby Velodrome with the aim of completing as many laps as possible in the time provided. The pair were part of a team that included British cycling champions and a Paralympic gold medallist and, just to make it interesting, they were representing Derbyshire against another team representing East Midlands rivals Leicestershire. Mike has a problem with his sight and wanted to raise money for Sight Support Derbyshire, who have a base at our Eye Centre, so he asked his colleague Mary-Ann to support him on the tandem, helping to raise a magnificent £400 for the service. 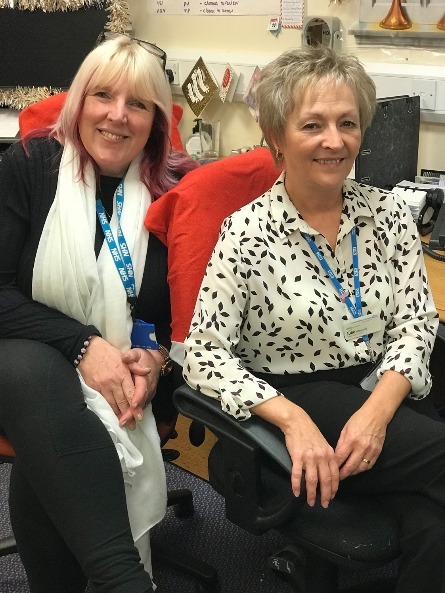 They both work on the Trust’s Eastwood ward Stroke Unit and frequently make referrals to the service on behalf of patients who suffer vision problems as a consequence of stroke. And to cap off a perfect day, the Derbyshire team emerged triumphant from the duel to retain the trophy! Congratulations Mike and Mary-Ann for bringing more glory to the county and our hospital! 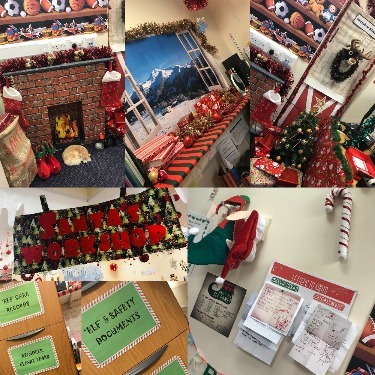 ​The Patient Safety Team has turned its office into a Santa’s Grotto to say goodbye to two of its colleagues. Julie Howard (right) and Sally Cobb (far left) will both be leaving the Trust on December 22nd and the team have transferred the office into a festive treat, complete with roaring fireplace, toys and games and lots of tinsel! Julie has worked at the Royal for 28 years, starting out as a cleaner in our Theatres before becoming a receptionist on our Intensive Therapy Unit, moving onto Patient and Public Involvement before eventually ending up in her current role within the Patient Safety Team. Sally is a relative newcomer compared to Julie, joining the Royal in 2003 in the General Admissions Office before moving to the Medical Records department as a Library Supervisor…she’s been with the Patient Safety Team for eleven years. 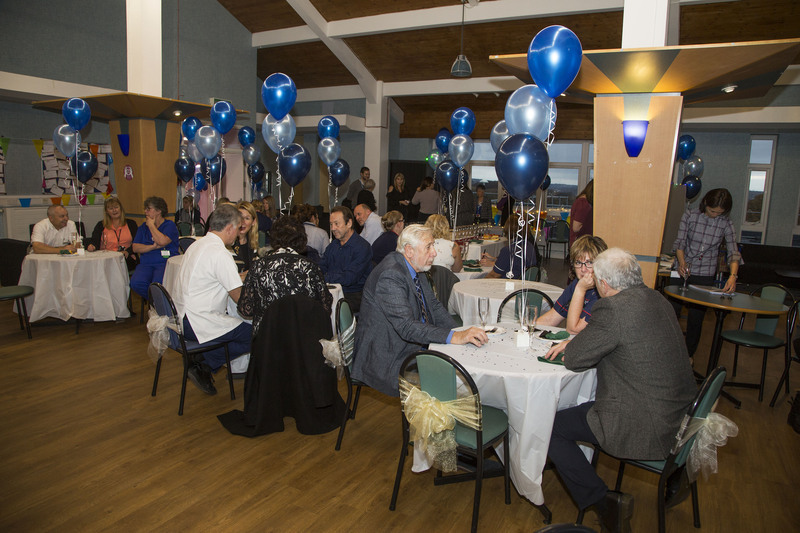 ​A range of colleagues from across the Trust came together for a celebration of long service in the NHS, on Tuesday 21st November. Members of staff from several different departments of the Royal gathered at Relax@TheRoyal to mark 20, 30, 40 and, in the case of Angela Wainwright, 50 years of service! The grand total of combined years of service was a staggering 1,820, serving and caring for patients across the country. 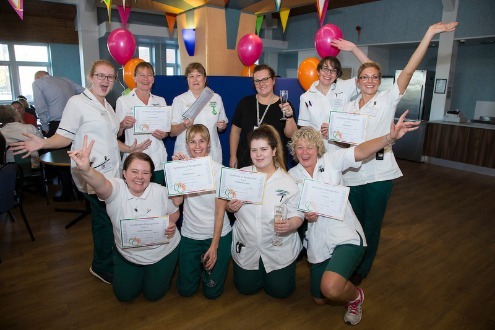 Staff were given a certificate and voucher to celebrate their commitment to the NHS and were treated to a glass of champagne (alcohol free of course!) with a delicious selection of pastries and cakes! 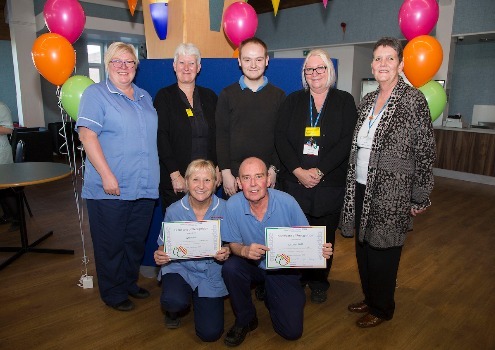 Chief Executive Simon Morritt, Chair Helen Phillips and Director of Workforce and Organisational Development Zoe Lintin were on hand to congratulate each staff member who could attend the event. Not everyone who reached a milestone was available to attend, but they have all been listed below. Spot anyone you’ve worked with before?! ​It seems our Stroke Unit Rehabilitation Team is getting younger! 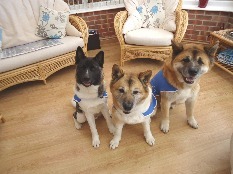 Ten year old Kendo, 7 year old Sumi and 9 month old Khal are Japanese Akitas and have started visiting our stroke patients receiving therapy on the Speedwell Rehabilitation Unit, courtesy of Canine Concern. They are brought by dog handlers, and the owners of the dogs, Steve and Bev Deighton, who volunteer to spend time with the patients, recognising the therapeutic effects that dogs can give. Steve said: “They are fantastic for dementia and stroke patients because stroking a dog is a very calming and relaxing experience and it lifts the spirits. Certainly in the case of dementia patients, it enables them to recall pets they may have had when they were younger and stimulates the mind. In all cases it helps to take their minds off their treatment and give them a moment of calm to enjoy the moment. ​To become registered as Therapy Dogs they have to undertake a strict assessment and are required to be good at sitting with the patients. They are assessed on how to take food safely when offered, be capable of sitting still when others are having conversation, and when they are subjected to simulated stressful situations to assess how they might react to sudden noises such as a fire alarm or a patient who has a sudden change in mood. “They are very social dogs and love people so it isn’t just hospitals that we visit. We have an open invitation to the NGS Macmillan Unit and regularly visit the Nightingale children’s ward here as well as Durrant and Ashover wards. Kendo also visits schools where children may be having reading difficulty, learning and concentrating issues and it helps to relieve the pressure they put on themselves in classroom situations and has a reassuring effect. 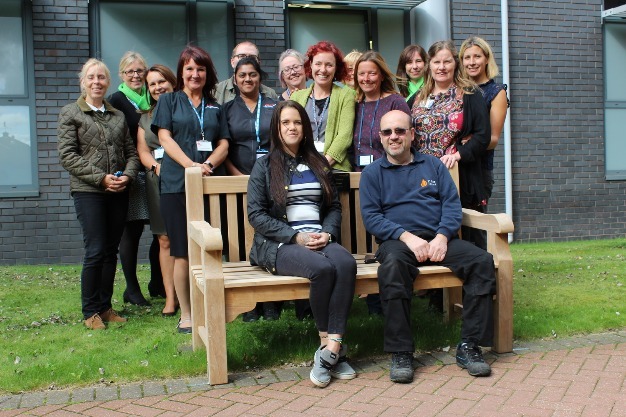 The family of a much loved colleague within the CAMHS team have left the Trust a lasting gift in her memory. On 17th September 2016, Lead Primary Mental Health Worker Diane Cooper lost her fight against Oesophageal Cancer. It shook the entire team, based on the second floor of The Den, with whom she’d worked since 1987. Diane’s base was in an office at the Royal but she spent a lot of her time out in the community where she worked with children and their families in schools, doctors surgeries and in children’s centres to carry out mental health assessments, supporting the children and those who worked with them. ​Heather McAlister is a Consultant within CAMHS and a close friend of Diane’s, she said: “It was a very difficult time for all of us as it happened very quickly. Diane continued working right up until the end, coming to work in a wheelchair. She was incredibly dedicated to her job and loved it so much, often staying beyond her normal hours to make sure that she did right by the children she treated and the families she supported. 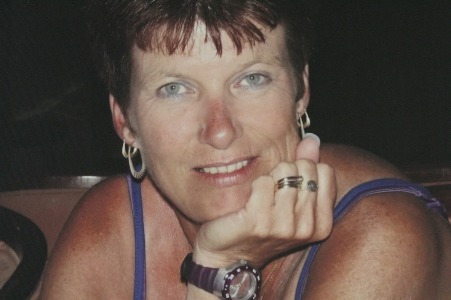 Diane’s love for her work and colleagues was not lost on her family. Her daughter, Kirsty, came up with the idea of donating a bench with a plaque as a memorial to their much-loved friend. Diane’s husband Mark said: “We had a collection at Diane’s funeral which raised a substantial amount for the Macmillan Appeal to help build the NGS Macmillan Unit. We kept a little back in the hope that we could do something a bit special and Kirsty’s idea was a lovely thought. ​A project undertaken to improve the relationships between the Trust and patient’s carers has been nominated for a Nursing Times Award for the work done to recognise carers. A Trust working group was established in April 2016 to develop and implement a Carer’s Charter as part of a local care quality improvement initiative with involvement from many disciplines across the trust, contribution from external agencies such as adult social care and Derbyshire carers association, as well as vital input from carers themselves. The Trust signed up to the Carers’ Charter in June this year, committing itself to carers and the role that they play in the treatment and care of our patients. 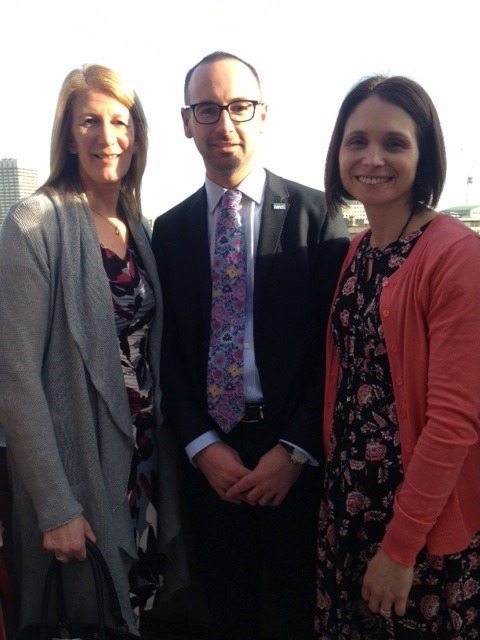 The work done by Rebecca Cowley (picture right, with our Chief Executive Simon Morritt having signed the charter), who was the project lead, overseen by Divisional Head of Nursing for Medicine and Emergency Care Rachel Whyman, has been shortlisted for the ‘Enhancing Patient Dignity Category’ of the Nursing Times Awards 2017. ​Rachel said: “Rebecca was on secondment to get this project off the ground and put a huge amount of work into it. Achieving the goals we had set ourselves to develop and implement the Carers Charter, and for the Trust to subsequently sign their commitment to it, is far from routine, the work she did, with the help of our ward teams, was incredible. Thanks to her work and co-ordination we now have carer champions on each ward, carers passports, an educational package for staff and carer information packs, and most importantly, a growing recognition from all staff groups of the vital role carers play in high quality patient care. Rebecca added: “Carers do not always recognise that they are ‘carers’ in the broadest sense. They could see themselves more as husbands, wives, mothers, sons or close friends. It’s about recognising that fact and using the expert knowledge that they have about that particular patient to help treat the patient, improve their experience and reduce their length of stay. The charter was signed by the Chief Executive Simon Morritt during National Carer’s Week, to demonstrate the commitment that the trust has made to carers. Rachel and Rebecca will be going to London to present their work to a judging panel in September, and the winners will be announced at a ceremony in December. Our Head of Midwifery has had an article published in The National Childbirth Trust’s (NCT) quarterly magazine about her and the Trust’s approach to supporting parents through stillbirth. 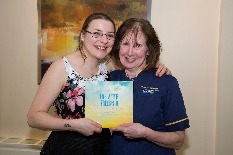 Linda Gustard has worked very closely with a lady called Sarah Smith (picture together, left) who wrote a book, ‘Life After Stillbirth – Your New Normal’, with the support of Linda and the Chesterfield Royal Hospital Charitable Funds. This work was done after Sarah lost her son, Joel, on her due date and struggled with a lack of information following his funeral. Linda listened to Sarah’s concerns and for her idea of a book and supported her in the writing and publication of the book which is now handed out to parents who have experienced a stillbirth. ​Linda said: “Here in Chesterfield, we pride ourselves on being sensitive to the needs and emotions of parents under these very sad circumstances. Birth and death are supposed to be separated by a lifetime and it’s the complete absence of life from stillbirth can become difficult for anyone who hasn’t experienced such a loss to understand. Mothers need to feel connected to their baby in terms of contact in the same way as if their baby were alive, they have given birth after all, fathers need to be involved and our midwives are fully trained in assessing the many different situations circumstances that can result and we have a bereavement service and dedicated room. “Sarah described her experience here at the hospital as comforting and helpful but it didn’t necessarily prepare her for what was to come. I had always thought that the information we gave to parents was adequate, certainly we hadn’t heard anything from parents to the contrary, but it became clear from having spoken to Sarah that there were gaps. The information contained very little following the funeral and this was why Sarah used the expression ‘Your New Normal’, meaning that nothing would be same again. You can read Linda’s article in the summer issue of the NCT’s magazine ‘Perspective’ by clicking here. ​One of our midwives has been elected to the Royal College of Midwives Board after nearly 25 years at the Royal. Pauline Twigg joined as a student midwife 24 years ago before making it official with her professional qualifications three years later. She decided to put herself forward as a candidate having completed a secondment with the RCM as a case worker, thoroughly enjoying this role, and was asked if she’d consider standing. Pauline said “I talked to our Head of Midwifery, Linda, wo was very supportive of the idea and, having been an RCM rep for more than ten years, I really enjoyed working with the RCM and supporting midwifery and maternity services. I wanted to get more involved. It was a national election with all members of the Royal College of Midwives able to vote and, as a candidate, I had to submit a paper explaining what I stand for and why I should be elected. Following the voting process I got an email telling me I’d been successful and her I am; a board member for the RCM. As well as being a boost to Pauline’s standing as a midwife and a great addition to her CV, it is fantastic news for the Trust as well. Pauline will be able to support the Chesterfield Maternity Team as they adapt in the rapidly changing world of midwifery. ​A colleague in our Procurement team is walking across hot coals to help raise money for two causes in memory of her brother. Zoey Henchliffe’s brother, Christopher (pictured left), was killed by a single punch whilst on a night out in Chesterfield and she has organised the event, taking place on 27th August at the Olde House pub on Loundsley Green Road in Chesterfield, along with her Mum, Yvonne. Chris died on 12th July 2016, nine days after he was assaulted during a night out. 22 year old Benjamin Edwards was sentenced to five and a half years in prison for his manslaughter following a six day trial at Nottingham Crown Court. Chris was transferred to the Neurosciences department of the Royal Hallamshire Hospital from the Chesterfield Royal; Zoey and her family are looking to raise money for Neurocare who raise money for that department and also for the Royal British Legion as Chris was in the Army for four years. She said: “We all miss him so much; he was a lovely man, father, and a brilliant brother to me. We’ve tried hard to raise awareness of how one punch can be fatal and promoting drinking soft drinks in town, including a campaign to ‘Stay Cute and Dilute’. That’s what this event is in aid of, the two charities and the message we want to spread, but we wanted to do something that would involve families and be fun. “We wanted it to include something we’d never done before and, I still have no idea why, my mum suggested fire walking. It certainly fell into that ‘try something new’ category and the more we looked into it, the more we realised that it was possible, could be incorporated into a fun day and attract sponsorship. “For those taking part and raising money there will be an hour’s training and then the main event takes place at 7pm. We’ve also got a DJ all day, Spire Limos offering rides, strongman Simon ‘Power’ Plant will be performing feats of strength on the day as well as the usual raffles, lucky dips, stalls and face painting. The event starts at 2pm until midnight on Sunday 27th August at The Olde House pub in Newbold. If you would like to get involved then you can contact Zoey via email on zoey.henchliffe@gmail.com for a sponsor form or contact Yvonne on 07926523768. You can also donate to their Just Giving page by clicking here. 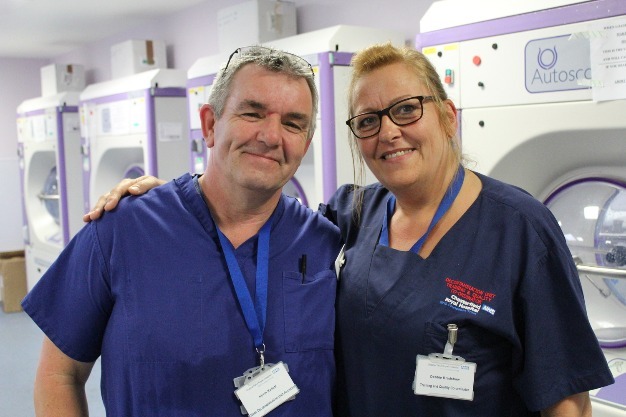 ​The quick thinking of a colleague and a marvellous example of joined up care has led to a speedy recovery for one of the Decontamination Unit team who suffered a heart attack at work. Kevin Kellett is a Decontamination Assistant and was experiencing tightness in his chest shortly after arriving for work at 6am on Friday 21st April. He went to see his colleague, Training and Quality Co-Ordinator Debbie Bradshaw, who took him into the tea room to sit him down. Debbie said: “He told me that he thought it might be heartburn but his colour had drained so I was a little concerned. He said he’d been changing the chemicals in EDU so I went in to check that he’d not ingested or inhaled anything that might have caused the chest pains but everything seemed fine. When I got back to him he looked even paler but he still said that he was generally feeling okay. Kevin added: “I didn’t think I needed it but within a few minutes one of the team were there with the rest of them running in very soon after. They asked me questions, took my details and within a few minutes the porters were there with a bed and I was being taken to ED. Kevin was rushed to Sheffield Teaching Hospital where he was receiving treatment, including having a stent inserted, within three hours of Debbie’s initial call. “I was lucid and watching them do it on the monitors,” said Kevin, “which was very strange but fascinating at the same time. I don’t think I realised during those moments just how serious it was, or even that it was happening to it me…it was all so quick and efficient. “I can only imagine what my wife must have thought as she drove to Sheffield and what she expected to find when she arrived. When she walked in the room I felt fine, I was sat up in bed, kind of wondering what the fuss was all about. I was there for another three and a half hours before being transferred to Bassetlaw where I live. I spent a couple of days there and was discharged home where I’ve been able to undergo therapy and rehab. “It still seems incredible to me now that I was in three different hospitals in the space of about six hours. The joined up care between these hospitals and the East Midlands Ambulance Service was so efficient on the day that it may well have saved my life and has certainly helped me to recover faster. I managed to make it back to work within six weeks on a phased return and feel fit as a fiddle but I’m taking the doctors’ advice and taking it easy! 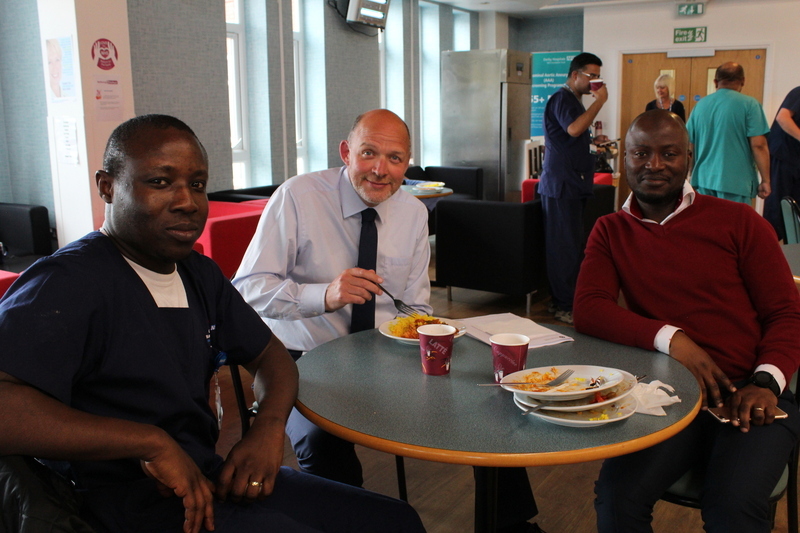 ​Medical staff from across the Trust came together to celebrate Eid, marking the end of Ramadan. One of our Emergency Department Doctors, Firasat Khan and Dr Murad, an Acute Medical Consultant, arranged for a meal to celebrate Eid that took place this lunchtime in our Relax@theRoyal staff area. Dr Khan said: “This is the Muslim equivalent of Christmas celebrations and marks the end of a month of fasting with a celebratory feast. Myself and a group of my colleagues set up a Whatsapp group to co-ordinate this and have opened up an invitation to colleagues of all faiths across the Trust to join us. Our Chief Executive came with our Medical Director Gail Collins and we asked colleagues in other areas including Anaesthesia, Medicine, Surgery and Orthopaedics to extend the invitation. ​The group of doctors that organised the ceremony all put money towards the feast. The catering team put on a menu of chicken curry and rice for the main course followed by dessert with tea, coffee and soft drinks. Reverend Colin Barrick was involved in its inception, he said: “I think it’s wonderful that we’re all coming together in this way to celebrate one of the most important days in the Muslim calendar. It’s true what they say that we have more in common than what divides us and I know that the Muslim community has been working very hard to raise awareness of Ramadan, what it means and involve people in the incredible feast to mark its passing. Simon Morritt is the Trust’s Chief Executive and attended the Eid celebration. He said: “I’m honoured to have been invited and it was a pleasure to mark one of the Muslim faith’s most important ceremonies. As a Trust we make a real point of marking Easter and Christmas and I think it’s important that we all come together and do the same to recognise other festivals. You can view pictures from the event in the slideshow above, to view the full gallery please click here. Adult learning has been celebrated at our annual Education Awards Ceremony which, this year, saw Chief Executive Simon Morritt say a few words with awards presented by Partner Governer Lynn Tory and Deputy Director of Nursing and Patient Care Bridget O'Hagan. It's a wonderful occasion where months, and sometimes years of hard work to further develop careers are rewarded with academic achievement in the form of certificates, badges and diplomas. By keeping up to date with learning and training we are better able to give our patients the best possible care and this Trust does all that it can to support our staff in accessing and completing this training. Ross Martin, Steven Gregg, Kamen Ducker, Jamie Holland, Dominic Heath. Ian Hemsworth, Steve Hollingworth, Jackie Jordan, Alan McPhail, Dave Spencer, Stuart Russell, Margaret Wright, Eric Thornhill, Trina Jackson, Anna Swift, Pat Wigmore, Ami Archer-Barker, Lynn Backhouse, Jake Stone, Nicci Penk. Sheree Bradshaw, Tracey Hodkin, Rheanna McPhail, Anna Jenkins, Carolyn Milner, Karen Newton, Editha Pintor, Elisabeth Roe, Rebecca Smith, Karen Squires, Laura Stewart, Yovana Ward. Janet Brown, Abigail Pickup, Samantha Ellis, Kelly Spencer, Anna Griffiths, Joanne Rees, Jemma Landicho, Carol Roberts, Bethany Leusby, Wendy Swift, Maria Pickering, Mary Whittle, Alison Burrows, Stevie Jones, Lucy Collumbine, Emma Lennox, Susan Diggle, Debra Peploe, Laura Harrison, Ronald Ramos, Emma Hopkinson, Jodie Owen. Lorna Bothamly, Sheree Bradshaw, Tracy Coppinger, Stacey Elbelkasy, Hayley Gregory, Sharon Jarvis, William Kinsey, Aimi McKinley, Sarah Moulds, Joanne Oldale, Samantha Pennell, Rachel Revill, Kimberley Smith, Diane Stevenson, Alessandro Squarcina, Julie Whitmore, Amanda Hardy, Ambilimol James, Carla Grundy, Donna Taylor, Holly McLean, Jade Alexandra Fisher, Julian Francis Atkinson, Kelly Spencer, Lorna Bateman, Nicola Mallen, Rebecca Massey, Rebecca Dixon, Shelley Jones, Stephanie Blakeley, Nicola Imrie, Colette Dye, Deborah Lievesley, Kelly Oliver, Rebecca Hewins. Elizabeth Haslam, Laura Keane, Emma Smith, Samuel Badger, Donna Jarvis, Vivian Mwashita, Susanne Glasby, Maria Coleman. Hannah jenkins, Kerry Newton, Lindsay Starkey. Charlotte Adams-Heath, Ryan Barnett, Cheryl Baker, Tamisha Bayford-Wynn, Amy Booker, Joanne Borea, Lorna Bothamley, Lorraine Brooks, Siobhan Browne, Melissa Bulloch, Shelley Butler, Caroline Cook, Helen Corfield, Lauren Dack, Jennifer Dann, Joshua Draper, Joanne Earrye, Caroline Flint, Vcitoria Grayson, Rebecca Hall, Beverley Harvey, Susan Hawkin, Julie Hopkins, Donna Jarvis, Lisa Lewis, Claire Mestdagh, Karen Newton, Virginia Pearson, Margaret Peat, Sarah Renwick, Sarah Ridal, Rebecca Sears, Emma Sharp, Susan Shore, Karen Squires, Lesley Swale, Irene Villmora, Carly Walsh, Bronwen Waring, Rebecca Wilks, Sally-Anne Wright. Diane Burgess, Leanne Carter, Rebecca Gipson, Kirsty Miles, Hayley Pickles, Abigail Pickup. Paula Groves, Bekki Lawes, Deborah Wilcock, Carol Turner, Rebecca Wilson. Lorraine Bagnall, Jacqueline Ball, Rachel Barker, Diane Barksby, Kathryn Bingham, Claire Birch, Jess Bittles, Carole Bramley, Stephanie Brassington, Helen Brown, Aimee Bryan, Mary Callender, Zoe Crawley, Tracy Crofts, Natasha Crossland, Louise Davidson, Joanne Davies, Alison Galloway, Michelle Gascoigne, Gemma Gayles, Michael Hall, Lindsay Hall, Jane Hall, Julie Hallam, Bethany Higgins, Charlotte Hulatt, Marie Jenkinson, Susan Jobi, Kylie Kasprzycki, Danyel Kelly, Soumya Kuriakose, Michaela Lance, Lindsay Lowde, Suzanne Lowe, Catherine Mansbridge, Carla Marsh, Sophie McCardle, Susan Morris, Danielle Oldfield, Dawn Parkes, James Pickess, Chelsea Porter, Nicole Porter, Sarah Putland, Bethany Ravey, Jodie Rodgers, Amanda Rose, Julie Rowley, Fiona Schmidt, Debbie Sharpe, Katie Spencer, Karen Stevenson, Adam Torincsi, Kari-Lynne Whitaker, Claire Whitbread, Melanie Wilson, Stephanie Wright, Sarah Wright. 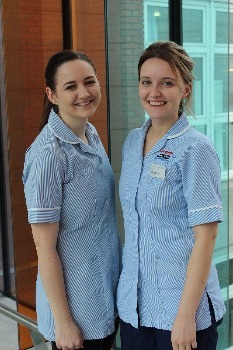 Two of our staff nurses are going to Nepal for two weeks to lend their medical skills to villagers who really need it. Helen Kearney (pictured, left) and Megan Wood (right) are staff nurses on Ridgeway ward and will be flying to Kathmandu in September, from where they will undertake a six hour hike, set up camp and provide medical treatment for the surrounding villages. It’s part of the Trekt Adventure ‘Medical Treks’ which allows people with experience of healthcare and clinical practice to volunteer their skills to local villagers. Helen said: “I’d always wanted to do some kind of volunteering and got talking to Megan about it so we decided to look together. We initially looked at Africa but that was more about volunteering whereas the one in Nepal looked much more ‘hands on’ in terms of medical work and being able to provide these villagers with a nurse for a day appealed to both of us. The camp usually consists of fourteen doctors and nurses, some volunteers and they will have their own cook and guide. The team will hike for a day before setting up the clinic for the following day so every other day will be a hike further into remote Himalayan wilderness. The village surroundings are very mountainous and there is lots of wildlife but Helen and Megan are prepared for that. ​Megan added: “I want to prove to myself that I can handle it in the wild and also that I can transfer the skills I’ve learnt on the ward into a challenging community setting. I qualified as a nurse in March 2016 so me and Helen have known each other a while and I know we can support each other if we have a wobble out there. Helen has more experience than me having been travelling and backpacking before. Helen and Megan will fly out on 8th September for the trek which will start on 12th…we’ll catch up with them when they get back, we’re sure they’ll have some stories to tell!!! ​Our Ophthalmic Photographer has taken a little off the top by shaving his head for the Little Princess Trust having spent almost an entire year growing it! Jake Oakley (above left and right, before and after!) 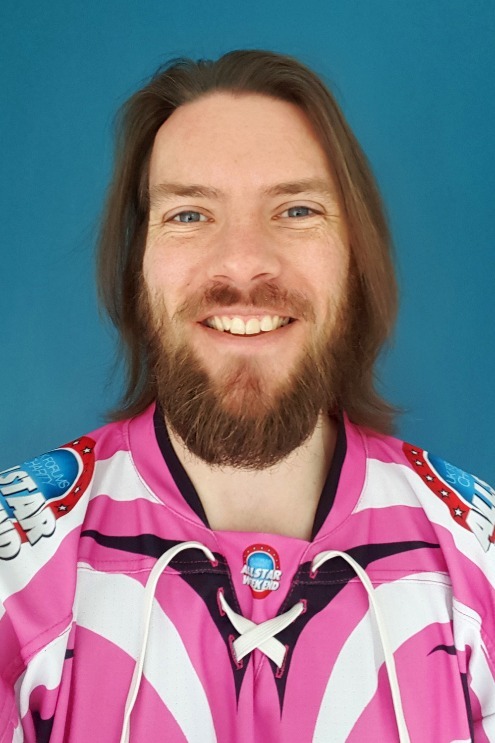 spent a large part of 2016 raising a considerable amount of money, almost £20,000, for Breast Cancer Care in his role as captain of a Ice Hockey Team that took part in the UK Forums All Stars Tournament in the summer. However, in his own words he wanted to ‘give more than just money’ which became the inspiration behind his latest charitable activity. Jake said: “I’d had a stubble for quite a long time so decided to let it grow for a bit along with my hair and people started to say that it suited me so I carried on for a bit. I’d always had short hair before and my sister had at one point wanted to donate her hair to the Princess Trust so I thought it was something that I could on behalf of both of us. Jake entrusted his locks to a Hair Salon in Greenhill, a friend of his co-owns the Ambiance Hair Salon where he took the hot seat to go ‘under the scissors’. “It was a little nerve wracking,” admitted Jake, “as I’d grown attached to my hair if you pardon the pun and it was a drastic change. In order to send it over to the Princess Trust they are quite specific about how it needs to be cut. I had to have my hair in plaits which is definitely a new look for me as it was past shoulder length by this time, to ensure they get as much as possible. They then get shaved off, placed into a bag and put in the post which was all very strange. You can still donate to Jake's cause through his Just Giving page by clicking here. 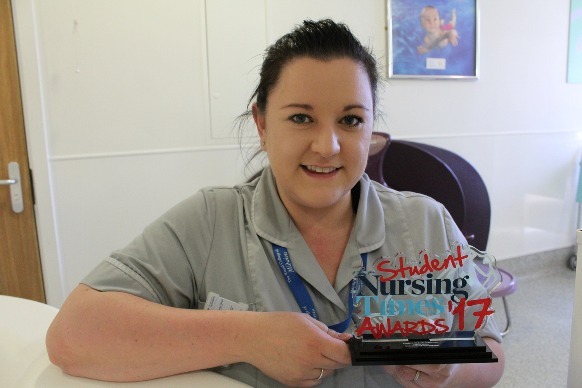 ​One of the student midwives on placement at the Royal has been named Student Midwife of the Year 2017 by The Nursing Times. Claire Vinter is in her third and final year as a student at the University of Nottingham and was nominated for her second year on placement. All student midwives across the country are eligible for the award and Claire was one of only ten who made the shortlist. She said: “I had to go down to the Nursing Times headquarters and sit in front of a panel whilst they asked me questions, which was incredibly daunting. They asked me questions such as in what way I think I’m a role model, I had to give them an example of challenging practice or people, how would winning the award change the way I approach my work and what does midwifery mean to me? Claire is on her final year at the Royal but also spent time on placement at the Derby Royal Hospital. She will graduate in August and be a fully qualified midwife in September. “We tend to do placements in more than one hospital now,” she added, “because there were concerns that midwives were becoming clones of their mentors. By spending time in more than one place you get to know different methods of working, learn different techniques and experience different environments. “It’s something I’ve always wanted to do and all of my choices at school were geared towards a career in care. I was a Maternity Assistant here at the Royal for five years and did an NVQ Level 3 in Maternity and Paediatric Support. I also did an access course supported by the Royal so I had experience of this sort of environment and learnt a lot before I even got to University. So, to paraphrase the panel who interviewed her ahead of the awards, what does midwifery mean to Claire? ​The Speech and Language Team has been raising awareness about Dysphagia and the problems surrounding swallowing. You might wonder what speech and language has to do with swallowing and the answer is anatomical. Speech and language therapists study the head and neck structures in great detail, part of which is an understanding that the food pipe and wind pipe are right next to each other. This presents the risk of food and drink going down the wrong way when somebody is unwell. The body has protective mechanisms in place to prevent this from happening but sometimes these may not work sufficiently. Kerry Danaher is one of our speech and language therapists, she says: “A lot of the patients we see who may have speech and language difficulties, particularly stroke, may also suffer from swallowing problems. As we have a good understanding of this particular part of the anatomy it has become our area of expertise and part of the work we do. “Our awareness event centred on Dysphagia which is a broad term used to define a range of symptoms. It could be that a person suffers pain when they swallow, something gets stuck in their throat or even their mouth; there could be an odd sensation when they swallow such as burning or it could be something that we see clinically. ​Part of the experience of which the team were aiming to raise awareness was the role of pureed food. 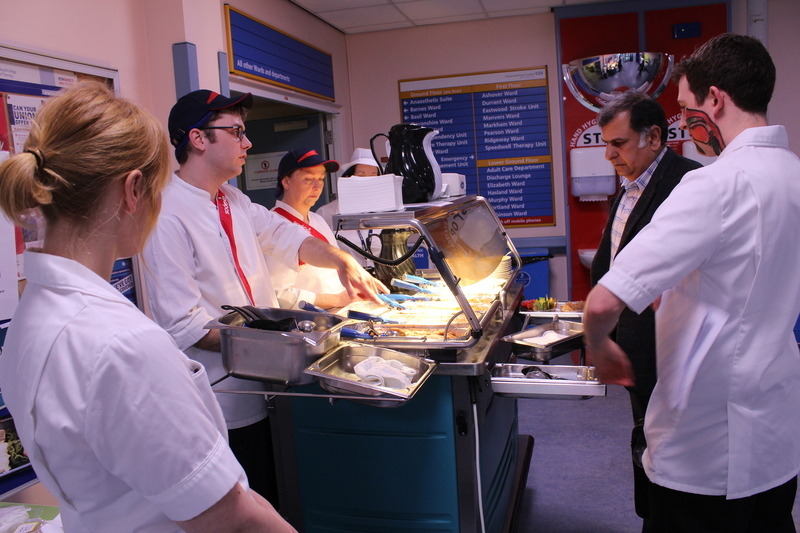 They arranged for breakfast, a selection of lunchtime courses and puddings to be brought from the hospital kitchens to their stall outside the EMU spine to invite people to sample the food. 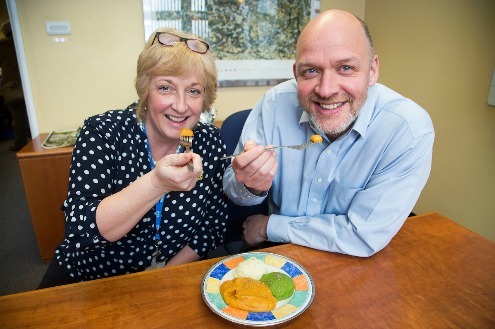 They also challenged themselves and Chief Executive Simon Morritt (picture right with Head of Adult Speech and Language Therapy Michaela Wright) to spend a day eating only pureed food. ​Kerry added: “We also took part in the challenge and the whole awareness event was a learning curve for us as well. We don’t see what goes into the making of this food and what goes on behind the scenes to make the pureed meals as appetising and nutritious as possible, to make it presentable on the plate and make certain that it’s safe for our patients’ dietary and swallowing needs. You can take a look at the web page and blog that our Speech and Language Team created and maintained for European Swallowing Awareness Day by clicking here. Three of our senior leaders have made it through the prestigious Nye Bevan Programme. Director of Nursing and Patient Care Lynn Andrews (left), Director of Workforce and Organisational Development Zoe Lintin (right) and Assistant Director of Finance John Williams (centre) completed the intensive, 12 month programme and attended their awards ceremony earlier in March to collect their certificates. The programme has been designed to develop senior leaders to better meet operational challenges and enable change. It has been tailored specifically towards experts in health and organisational performance, offering support and learning to build personal resilience, confidence and capabilities for effective leadership. ​John Williams added: “I have thoroughly enjoyed the programme and have already been able to apply elements of the learning to my own role within the Trust. In particular I’ve been focussing on the importance of patients being at the centre of decision making and listening and supporting our people to make changes to improve the care we provide to our patients. I have also enjoyed the opportunity to develop knowledge and experience around Systems Leadership; supporting the development of our local Derbyshire Sustainabity and Transformation Plan (STP) working with colleagues across the Health and Social Care sector within Derbyshire. The programme provides individuals with the skills to succeed at executive level, enhance and influence local policies, focus on their own behaviours to improve organisational outcomes and patient care and enact positive change to improve patient experience, staff engagement and morale. The Royal as an organisation will also benefit with skills developed to help in the retention of staff, improve leadership across the Trust, strengthen the effectiveness of the board and instil stronger preparation for the challenges ahead. ​Two of our Apprentices have been shortlisted for the North Midlands and South Yorkshire Apprenticeship Awards 2017. 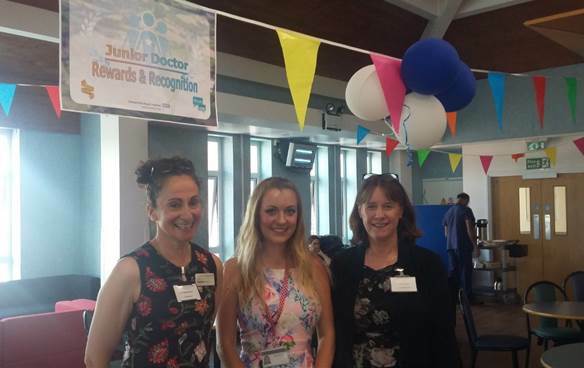 Ellie Varley, who is based in Pharmacy, and Sarah Hazeldine from the Research team were both recently recognised at the Royal’s own Apprenticeship awards. They were put forward for the regional award and have been shortlisted for the ceremony which will take place on 16th May 2017. ​Sarah (right) was on a short term contract with her previous employer before discovering the apprenticeship scheme, starting at the Royal in June 2014. Her time was split between the Human Resources Support Office and the Education Centre teams before she moved to the Research team in October 2014, completing her apprenticeship in August 2015. Hayley Watts, Apprenticeship Champion, said, ‘We’re delighted for Sarah and Ellie and remain very keen on supporting our local community and helping people to start their careers in healthcare here with us at The Royal. We’ve always supported apprentices and our managers are only too aware of the benefits that welcoming a new individual with fresh ideas and skills can bring’. It’s an incredible achievement for both Ellie and Sarah and everybody at the Royal wishes them the very best of luck. ​The Maternity Service at Chesterfield Royal Hospital has introduced a new role to allow midwives more time to carry out the duties that only midwives can do. Four midwifery support workers have completed their twelve week induction and competency assessment to enhance the care that our midwives already provide, working with midwives out in the community. 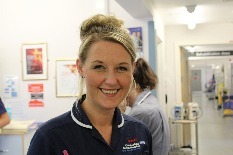 Sarah Petty is the Senior Matron for Midwifery, she said: “The aim of this new role is to enhance the care that our community midwives offer by providing support in tasks that don’t necessarily need to be performed by a qualified midwife. We talked through the support role with our midwifery team and identified areas where they felt support would be beneficial for them in terms of freeing up time to carry out tasks that only a midwife can do. 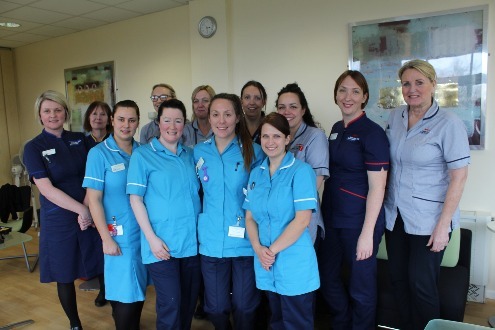 The group (picture above, left to right, and below with their mentors), Kate Swindell, Nina Crowther, Laura Carr and Frances Reed, started as Midwifery Support Workers in December and are now able to carry out their duties independently. Before then they were mentored and supervised by community midwives with each of them assigned to one of the midwifery bases. The Trust have just taken on another two Midwifery Support Workers who have just begun their twelve week training programme. They will be fully qualified and join Laura, Frances, Nina and Kate in June. One of our Biomedical Scientists has been praised for a presentation he did about the incredible work done by his team and colleagues within Pathology. Biomedical Science Team Leader Michael Collins was invited to the UK NEQAS (National External Quality Assessment Service) Microbiology Scientific Meeting in Bloomsbury, London where the focus was on the severe infection of Sepsis and about molecular methods of testing and diagnosing. 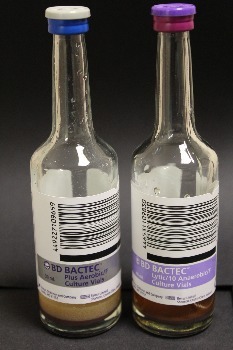 Michael said: “We thought that, rather than talking about the far more expensive molecular testing, my presentation would focus on how traditional methods of using blood cultures (pictured left) can result in significantly faster methods of diagnosis of an infection where quick detection is key to a favourable outcome for the patient. “The presentation outlined how the work traditionally done by Microbiologists during what you might call ‘office hours’ are done by the Blood Science team overnight. It means that turnaround times for blood culture samples are reduced dramatically without using any additional resources other than tapping into the willingness to learn new skills and the flexibility of both teams. The blood Culture analyser has been moved to Blood Sciences, where they work 24/7, allowing them to load cultures on receipt and begin processing any samples that signal positive, instead of being left until the following morning when the Microbiology team returns. The new way of working has seen 50% of cultures being reported within 24 hours of collection compared to just 2% for a teaching hospital. ​Following a number of suggestions by staff and the persistence of union representative Bridget Dunks, help and support from the Staff Partnership Committee (SPC) is now easier to find. Staff raised concerns about a lack of privacy when waiting for disciplinary hearings and a difficulty in finding and getting hold of staff side representation. But this has changed, thanks to your suggestions. Bridget said: “It all started when Nicky Hill, the Director of Workforce and OD at the time, gave up part of her office space. Staff attending disciplinary hearings had to wait on chairs outside the office and everybody who walked past knew precisely why they were there which was incredibly embarrassing. In giving up that office space it created an alcove, just a small space, but it was a place where we could talk in private, away from passers-by and, for me, made a huge difference. ​“The old office was based at Poplar Court which was hard to find. We had to go to Security for the key to lock it, it was dark and dismal and the wi-fi signal was patchy. When Amanda Rawlings took over from Nicky she wanted to know what I would like in an ideal world. So I asked for a room for the SPC in the main hospital building. There were a few options available but, at the time, nothing that was more appropriate than what we had at Poplar. “We went to one of the HR huddles and the question of a wish list came up so I brought up the subject of a room again and this was seconded by many of my colleagues. It seemed clear that they wanted us on the HR corridor and it came at an opportune time as there was a great deal of re-organisation with Amanda and then Terry Alty leaving. It meant that a room had become available. So, we talked with Acting Head of Workforce and OD Zoe Lintin and Ged Holland from Security about getting a staff partnership presence in there. “Within a few weeks we were in there and it’s made a huge difference to us and to staff wanting advice and help. For a start it’s a proper room where staff can knock on the door, come in and have a private discussion so it’s easier for them to speak out rather than meeting them in the corridor where they’re conscious of other staff walking past. All of the paperwork can be locked up more securely and, being situated at the top of the HR corridor it’s more easily accessible if we need it for a disciplinary hearing. Sarah Harrington-Pollock is Chair of the SPC. She said: “From my point of view it’s fantastic because I work in Imaging so it’s a place that I can do to do my SPC work where confidentiality and discretion can be upheld. It can be hard to find a quiet place within Imaging but in this new office I can use the phone and desktop knowing that I can focus solely on the issues affecting that particular member of staff without distraction. It also allows myself and Bridget to work more closely together to resolve problems quickly and gives us good access to the Executive Team nearby. One of our midwives has been instrumental in making sure that Chesterfield’s homeless don’t go without this Christmas. Jemma Temple, her colleagues and friends helped to collect 201 boxes for the Chesterfield Homeless Christmas Shoebox Appeal which have been taken to the Whittington Cricket Ground ready to be distributed to local charities. Jemma said: “I wanted to do something so enlisted the help of my colleagues and friends, supported by the Royal College of Midwives, to collect as many as possible. The support we had from the hospital was great, especially from the Birth Centre, Neonatal and Imaging and we collected a lot from my home town of Holmfirth as well. The donated shoeboxes contain items such as books, non-perishable foods, toiletries and small items of clothing such as hats and gloves. There were three categories of donations which were the homeless, dogs and the elderly with local charities including Contact the Elderly, The Freedom Project, Pathways of Chesterfield and Church on the Bus set to distribute the boxes. 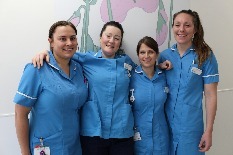 As well as being a midwife, Jemma (pictured right, far left) is also a Learning Rep for the Chesterfield Branch of the Royal College of Midwives, an elected position requiring her to help with the learning and development needs of her colleagues. It’s also about getting people more active in the workplace and the Trust has signed up to the Caring for You Campaign to help improve the wellbeing and safety at work of colleagues working within maternity. The Shoebox Appeal deadline for collection has been extended to the 9th December so if you would like to make up a shoebox and donate it then you can still drop it off at the Birth Centre before that date. Rolling Back the Years - Celebrating Long Service! Nicky Rollins (second from left) marking 40 years's service! ​Over the last few years, the Trust has been working hard to recognise long service within the NHS. 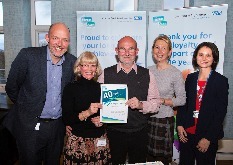 On Friday 18th November, colleagues who had worked within the NHS, not just at the Royal , for 20, 30 and 40 years were invited to an event at our Relax@theRoyal facility to acknowledge such a milestone. 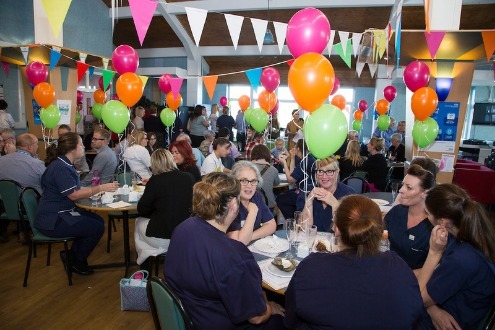 There was more than a thousand years of NHS experience crammed into that room with each member of staff treated to a glass or two of bubbly (non-alcoholic, but the bubbles still hit the spot! ), a buffet, a voucher reflecting their length of service and a special certificate to mark the occasion. 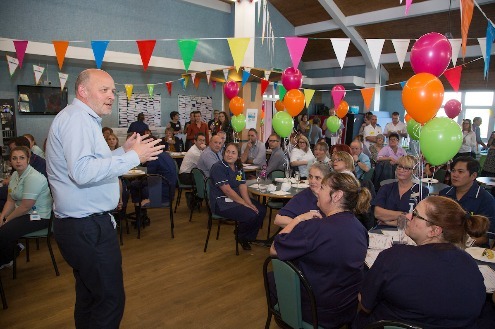 Chief Executive Simon Morritt, Chair Helen Phillips and Acting Director of Workforce and Organisational Development Zoe Lintin were there to hand out the accolades before a cake was cut to bring the celebrations to a close. Not everybody who was invited could make the celebrations but below is a list of all those that were honoured and how many years they’ve given the NHS, including Nicky Rollins, the only one from this group to work an incredible 40 years’ service…we’ll try and get hold of Nicky for an interview to feature in a future article. A special thank you to Volunteer Services Co-ordinator Helen Kirkwood, Workforce Information and HR Support Service Officer Meesy Goodwin and the Communications Team for organising and preparing the event. ​Keelie (Pictured, left) is one of nine trainee Advanced Clinical Practitioners (ACPs) who have been appointed at the Trust who are about to begin their three year training programme. The areas where the trainees will initially work include ED, EMU, Stroke, Care of the Elderly, Acute Surgery and Critical Care. One of our current nursing team about to undertake that training is Keelie Stock who is a Sister on Eastwood Ward Stroke Unit. Keelie has worked on the Stroke Unit for seven years, four of them as Sister, and is keen to progress her role, seeing this as an ideal opportunity. She said: “I’ve just finished a University module in Advanced Physical Assessment so was looking for something that I could do which would utilise these skills. I heard about the Advanced Clinical Practitioner role on NHS Jobs and thought it was ideal for me so applied. ​“I had heard about the role before and knew that if it came up here on the Stroke Unit that it would be a good fit for me. The role will be incorporated within this ward so in terms of my background, previous qualifications and the time I’ve spent on this ward it seemed to be a natural progression. “I’m aware that it will be a challenge, it’s a three year course which involves one day a week at University and four placements throughout the Trust. The last of these will be a year on the ward ​where you intend to practice which, for me, will be here on the Stroke Unit. I get the best of both worlds as I end up in my area of expertise where I have progressed through nursing but gain experience of other areas to develop new skills. ​“I know there have been some concerns but our consultant, Dr Sajid, has been incredibly supportive and welcomes the appointment. He’s brought in some books for me to help in my course and says they could do with all the assistance they can get. That is the main point of the role, to give us the qualifications and capacity to pick up on some of the time consuming elements of the consultants’ duties, such as prescribing, whilst losing none of the nursing side. Speaking for stroke anything that can maximise our doctors’ time in the treatment of patients is very welcome and beneficial for everyone. “I’m really looking forward to starting; in fact I don’t really feel like I’ve finished University since qualifying for my Nursing Diploma. Since then I’ve done a Degree in Nursing, a Stroke Diploma and of course my Advanced Physical Assessment. I think it’s vital, not just for career progression but for the continued development in knowledge and skills to be able to keep your nursing qualifications and skills set up to date. Keelie starts her training with the other Advanced Clinical Practitioners on 21st November. ​As you may already be aware, Dr Kiran Kumar has stepped down as the named doctor for safeguarding children so we’ve got an introduction to make! 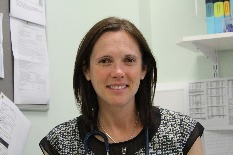 Dr Lindsay Lewis joined the Trust in early September as a General Paediatric Consultant, marking her first position as a fully-fledged consultant, and takes over the reins from Kiran as the named doctor. Lindsay said: “As the named doctor, I will be responsible, along with Theresa Critchlow our named nurse, for ensuring that all staff training relating to safeguarding children is compliant with national requirements. Importantly too, I along with Theresa, will able to offer advice to colleagues who have any safeguarding queries or concerns relating to a child, which are not answered through their usual route. In my role I will also ensure our policies and procedures with regards to safeguarding children, are up to date and meet local and national standards. ​She added, “I’ve settled in well, we’ve got a great paediatric department here and the whole team is wonderful. I’m based in Paediatric Audiology and you can reach me on bleep 625, extn 6871 or email me on Lindsay.lewis1@nhs.net .” I do work less than full time, my usual working days are Monday to Wednesday so please bear this in mind when trying to contact me. Lindsay completed her training at Sheffield Children’s Hospital in general paediatrics with a special interest in acute paediatrics and safeguarding. She has worked in many of the local district general hospitals and is now looking forward to her future here at Chesterfield Royal Hospital.